"Free Zumba In Park", Redondo Beach: is held every Tuesday during the summer. It will be the last one tonight, 1.5 hours later. Around 400 adults and 90 to 107 kids attended. The angel clouds I posted on my blog last week were photo-taken on the way there and at the park after 6 pm last Tuesday. The 3 to 4 Japanese ladies who live near-by were dancing there often. This is me. I asked the lady dancing behind to take a photo with my iPhone. 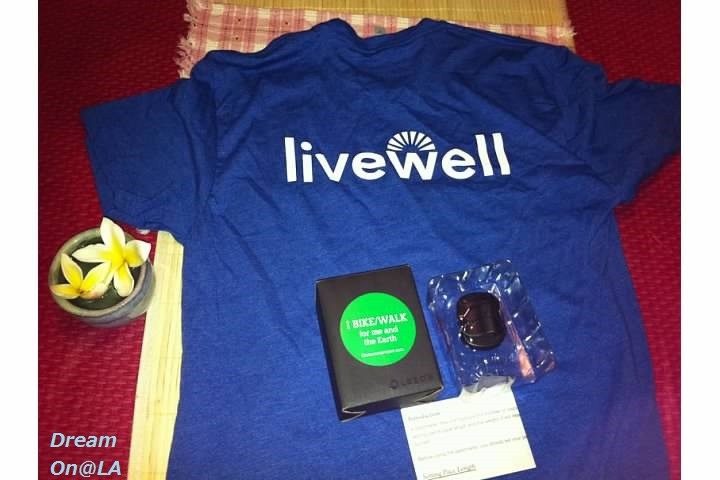 I got a T-shirt and Walk Step tool for free last week there for making big sounds and enjoying there. They also have free gifts today. I will attach the Email announcement from the Health association below. 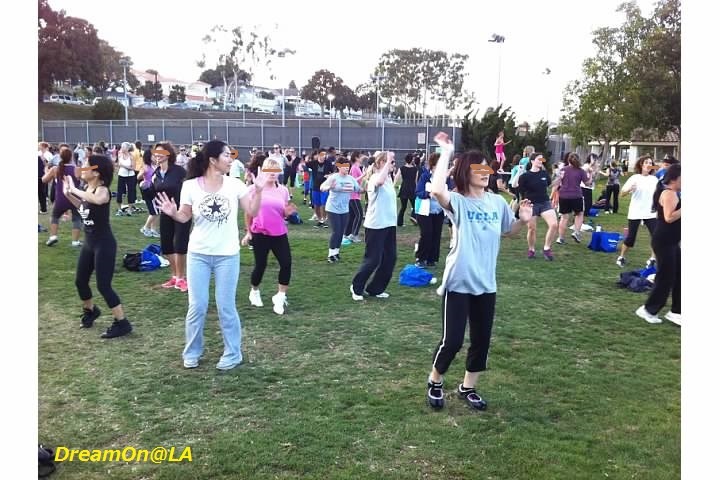 Tuesday, August 27, is this summer’s final Zumba in the Park, and we are hoping to shatter our attendance record and have more than 500 men, women and children dance their way to better health. But we need your help, so please invite your friends, family and co-workers! 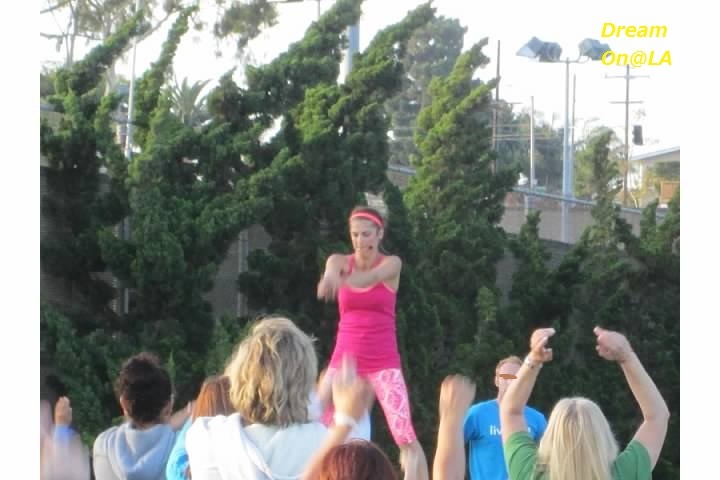 Today, Tuesday may be the end of Zumba in the Park this year, but we offer Zumba year-round at the Center for Health & Fitness. So be sure to take advantage of your 7-day Unlimited Membership and explore everything our fitness center has to offer, including Zumba, Yoga, Pilates and much more. I went to Yoshiki's LA Classical concert last night. My seat was 7th row in front of Yoshiki. It was fun to see him again in a few years. I will post that blog tonight or tomorrow morning. "Riviera Health Spa" opened in south west Torrance in 2010. 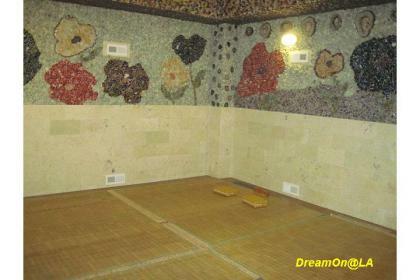 It has 4 kinds of Rock Sauna, a game room, treadmill room, a cafe, restaurant, and big bath-tub rooms, etc. 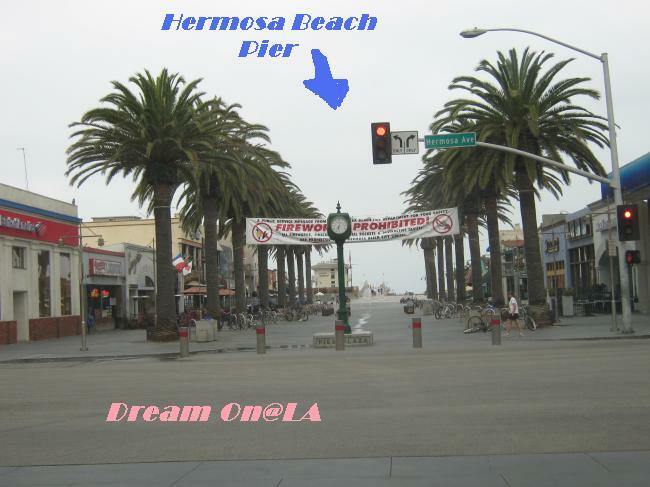 I went and relaxed there 4 hours in the afternoon on Jan. 8, 2012. It was crowded with lots of people with families. 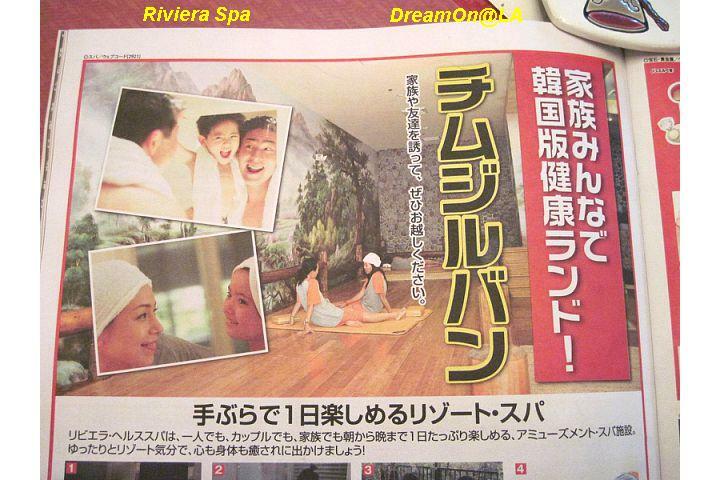 こちらが「Lighthouse」の広告です。/Here is the Ad on "Lighthouse USA" magazine. 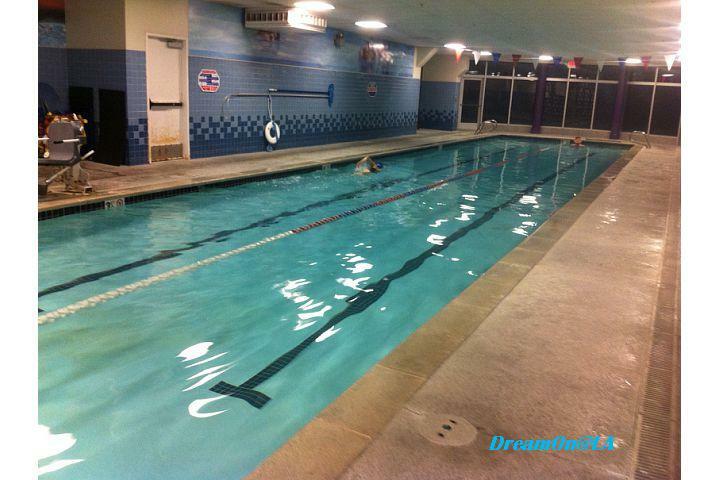 Spa Admission is $25 for Adult, $15 for Child (5 to 12 years old), or $180 for 10 guest passes. There is no time limit within the day. It's open every day from 8 AM to 12 AM midnight. 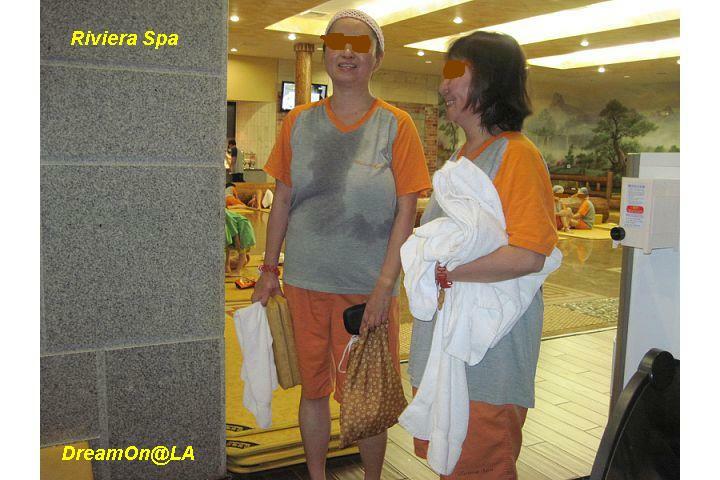 Upon paying the spa admission at the entrance, you are given a bath towel, a hand towel, a T-shirt a short pants, and a locker key to use in the facility. The Women's room and Men's room are separated on the ground floor. 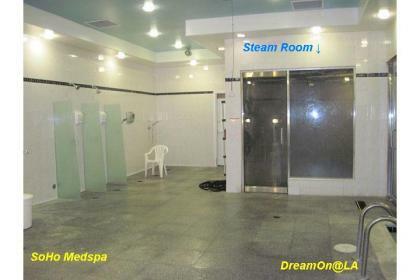 You take off your cloths, take a shower, a bath in the big bath tubs, relax in a sauna room or steam room in the area. 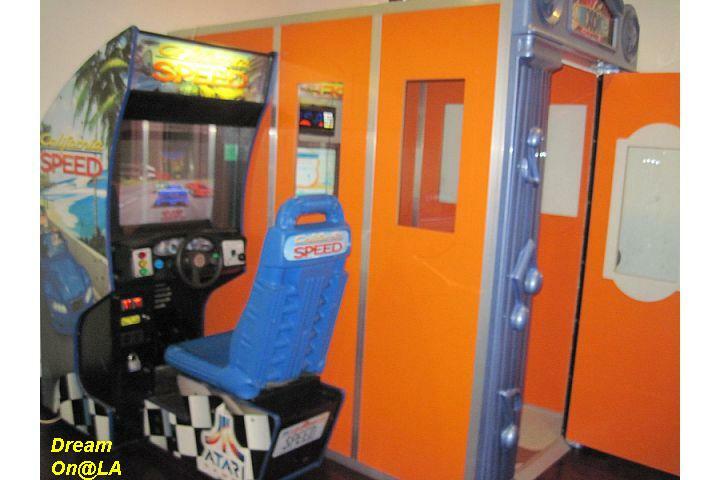 After getting dressed in the T-shirt and a short pants, take an elevator to the 2nd floor. The 2nd floor is the co-ed space for 4 kinds of Rock Sauna, a game room, treadmill room, a cafe, a restaurant, a shiatsu massage room, etc. 1000 year old salt containing lots of minerals including calcium, magnesium, and iron, cleanse cuticles. breathing through skin gets smooth, and you will be refreshed! It's effective for preventing diabetes! 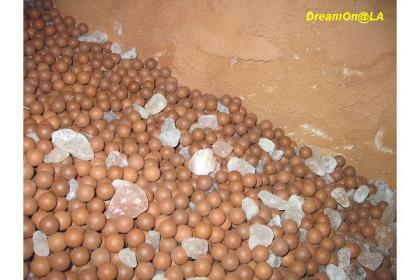 Tiny ball shaped natural clay will normalize breathing pattern. Your immune system will be improved. Harmful bacteria will be eliminated. 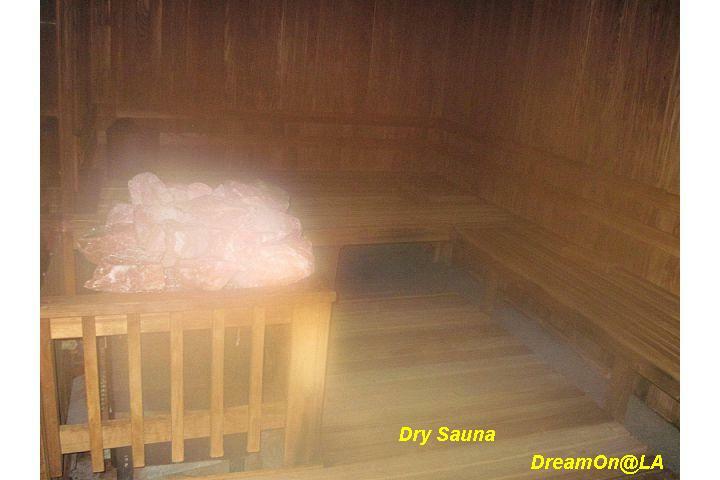 It's a very cold room, and it will cool down your hot body in between Rock Sauna. They have Korean foods, such as Stone Grilled Bibimba, Hot Tofu, Korean BBQ, etc. I was able to pay it later by showing my rocker key. 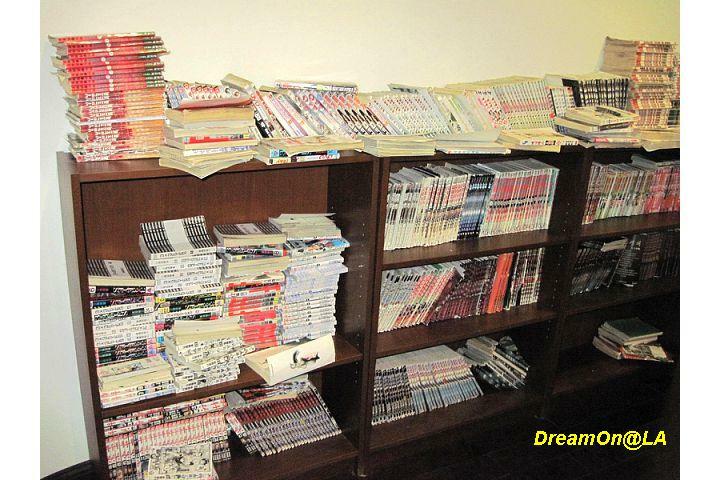 There were lots of comic books (all Korean) in the Game Room. I will bring my own Japanese comic books next time. 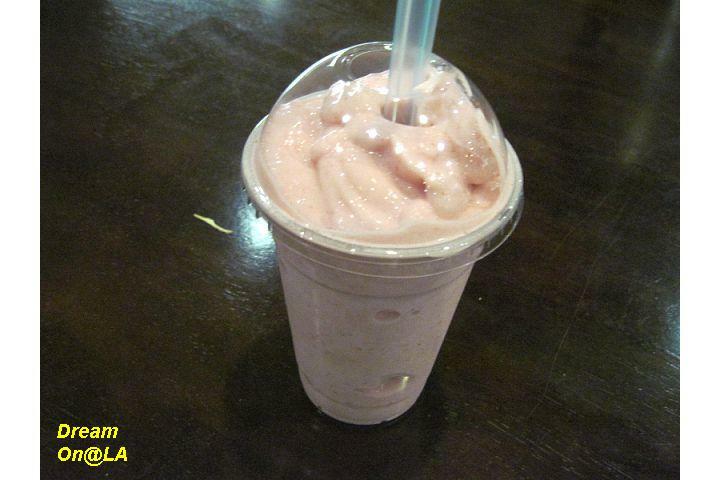 After spending 2 hours in Rock Sauna rooms, we relaxed in the cafe with a Strawberry Banana Smoothie. It was plenty, so I finished a half and kept the left-over in my locker room and took it to go later. There is a co-ed lounge on the 2nd floor. The entire floor in the lounge is heated. There are some TV's there. There is a patio in the back of the restaurant with tables and ash trays for smokers. The sunset glow was beautiful. 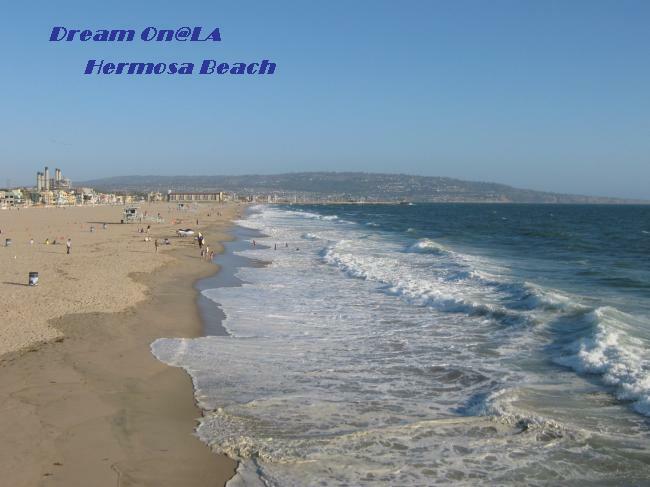 You don't get ocean view, but the Pacific Ocean is 2.5 Mile (4KM) west from there. It was cool and comfortable with ocean breeze. 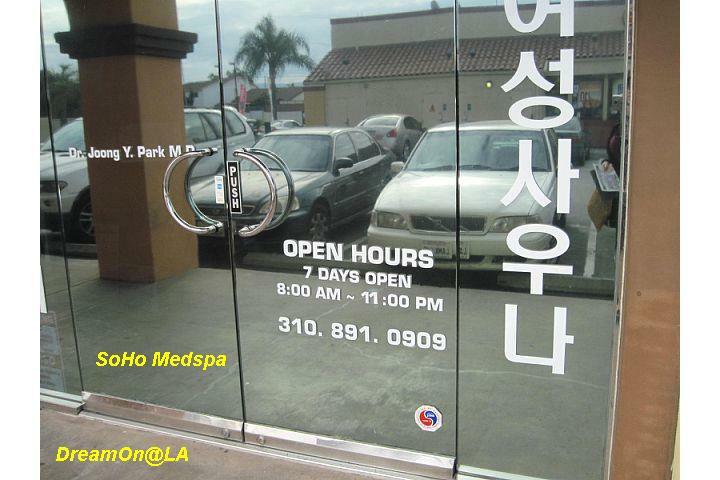 "SoHo Medspa, Korean Rock Sauna": I went there a few times on Sunday afternoon or evening. From this year, I'm trying to make relaxation time on Sunday PM. I went to two different Korean style Rock Sauna spas. 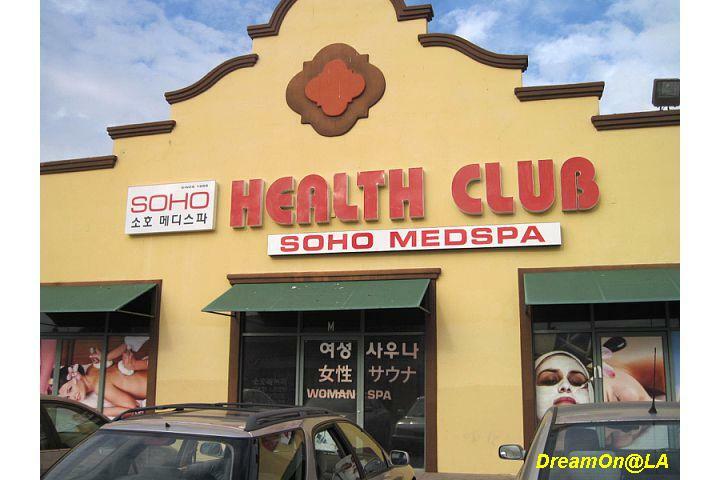 I will introduce "SoHo Medspa" first. A spa has been at the same place in Torrance for a long time, but it did a grand-opening last November. The spa fee is $10 as a grand-opening special. This is Women only Spa. You pay the spa fee at the front and get a key for a locker. 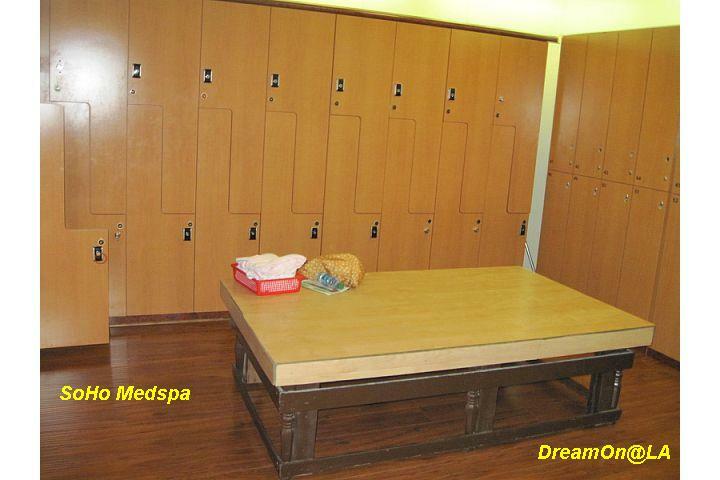 A bath towel, hand towel, and a bathrobe are there in the locker. You wear the bathrobe while you are in the spa. 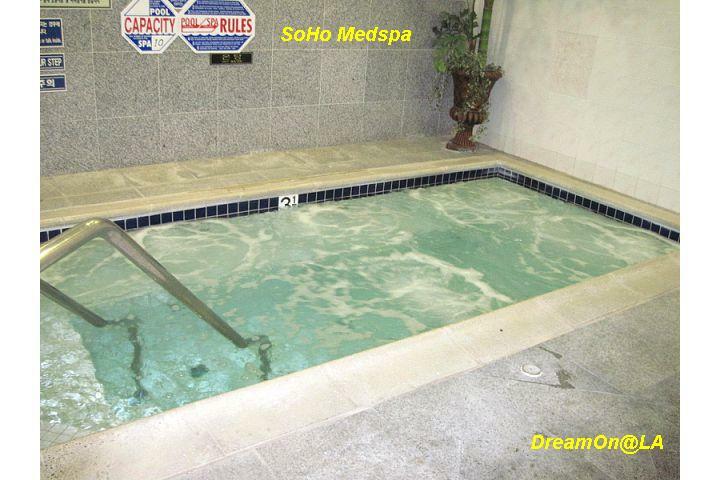 After taking a shower, you will get into the big bathtub, Dry Sauna, and or Steam Room... 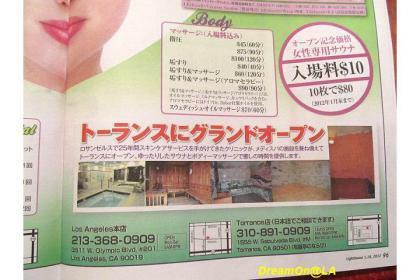 There were stretchers behind the big bathtub to get Body Sclub and massages. The floor is filled with ball shaped rocks. The temperature is kept very hot. 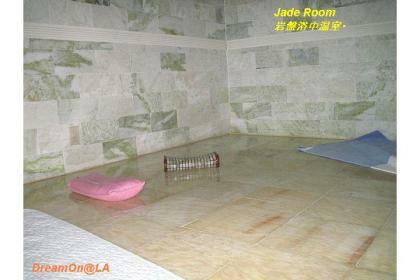 This room is small and good for 2 to 3 people. 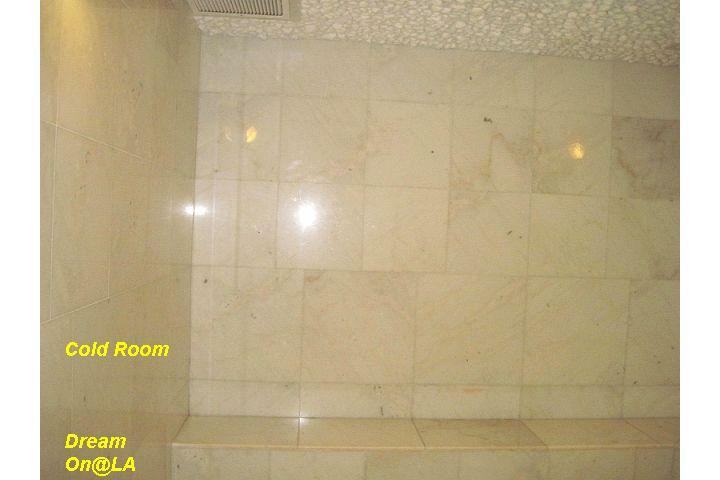 The floor is filled with marble tiles. The temperature is medium hot. You get sweat very slowly. Up to 6 people can lie down in that room. 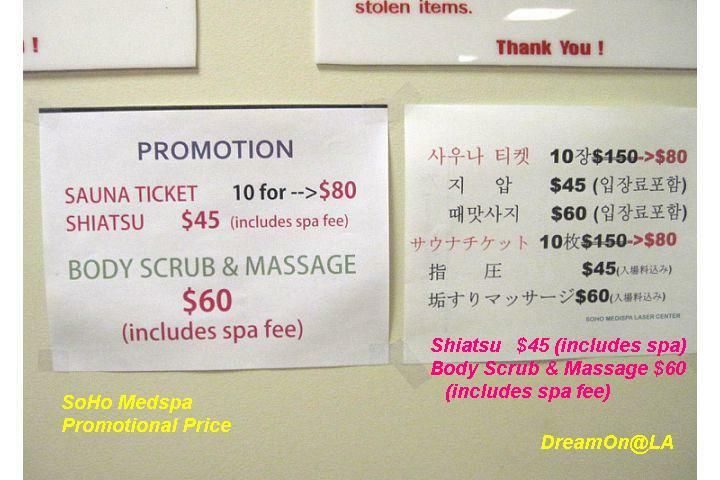 During the promotion, it's $80 for 10 spa passes, $45 for Shiatsu Massage (including the spa fee), and $60 for Body Scrub and Massage (including the spa fee). They have a cold water for drinking inside for free. 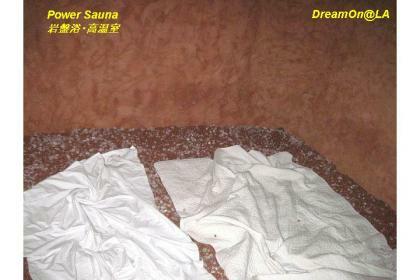 I kept drinking that cold water with lemon slices every time I got out of Rock Sauna room. I felt detoxed. I purchased 10 spa passes at $80 last night. They are valid for 1 year. "European 60 Body Wrap." I tried this last Saturday. I decided to visit Japan from this Wednesday. So I need to shed off unwanted fat in a few days! I tried this for the Belly and Back last February for once, for the entire body 2 years ago, and for "Belly, Back, and Legs" course for 4 times 9 years ago. 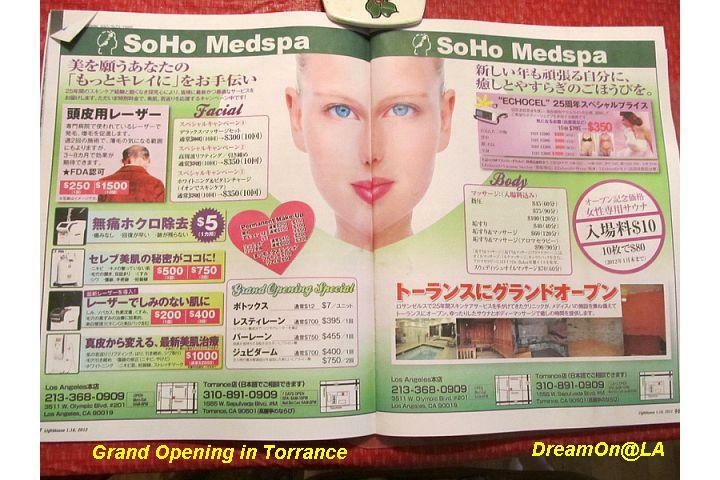 There is an ad on a local Japanese Magaine, "l'ovest" May issue about this salon. 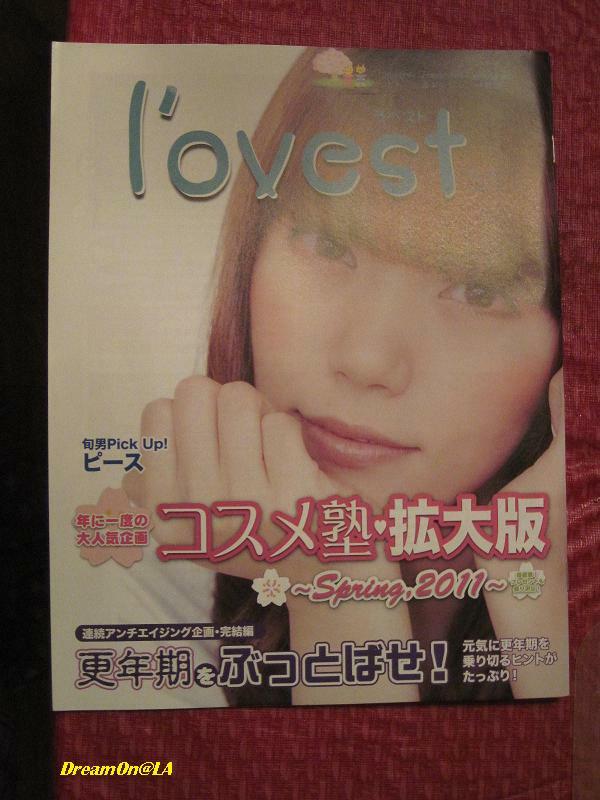 An ad on "l'ovest" April issue. 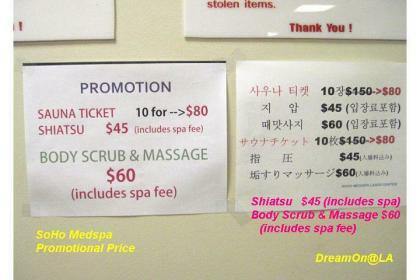 SPring Special Sale until May 31, 2011. I got "Entire Body Wrap" again this time. The photos were taken by Kathy, the owner. I leave the photos small, because I feel embarrassed. Kathy wrapped my body with bandages made of towel and soaked in natural herbs and mineral solution from my toes. 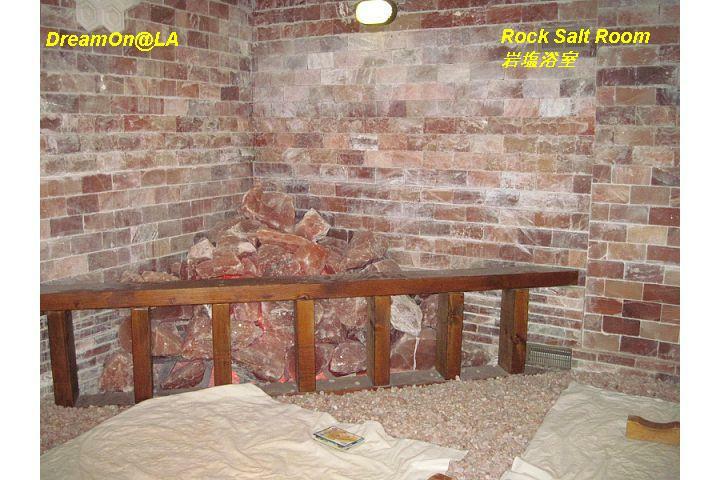 The herb and mineral solution is warm. After wrapping with the bandages soaked in herbs and mineral solution, they wrap the portions with plastic wraps over and over before they get cold. When they wrapped belly and lower back, it was wrapped while holding up the excess fat around the belly. My arms were wrapped, too. 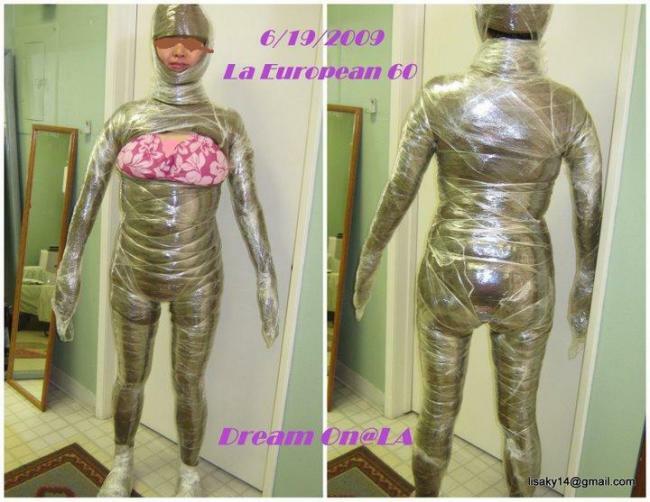 If you don't want to reduce the bust size, Kathy will not wrap your bust. At the end, my face was wrapped in the way to hold up cheeks and chin line. I lied down on a bed for 60 minutes and let the natural herbs and minerals penetrate in skin. The 23 kinds of natural herbs and 8 kinds of minerals will make the fat cells smaller and release wastes deposited in body. It also nurture and fasten skin, and reduce body sizes. I asked to take measurements before and after the body wrap. For 3 days after the body wrap, it is recommended to drink 1.5 litters of water a day, to avoid alcohol, and to avoid sweating too much. The herbs and minerals will continue to penetrate in the skin, and you will see better results. 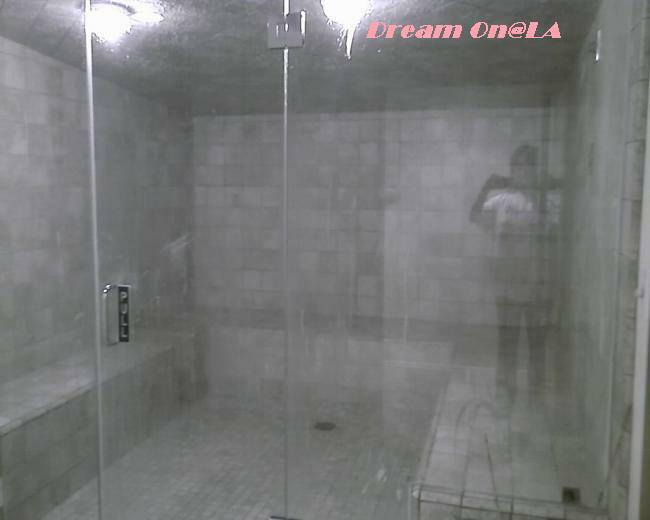 You can take a shower 4 hours after the body wrap. 24 hours later I measured. 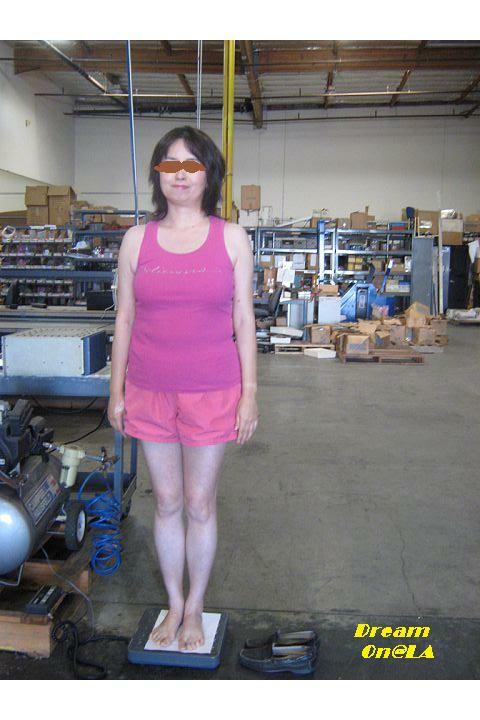 My waist and under waist were 2 inches (5 cm) down, and the bust and hip were 1 inch (2.5 cm) down. An American guy saw my previous blog on this Body Wrap and came to get it done every week for 10 weeks until last March or so. 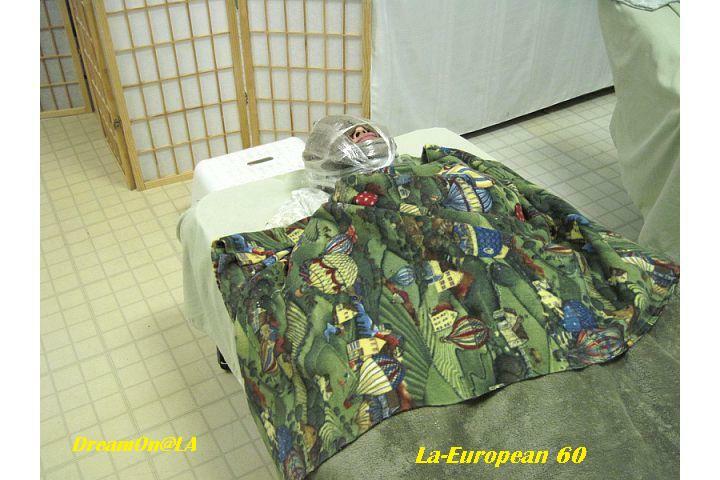 Two years ago, Kathy said there are many people who come from Japan to learn her "European body wrap" method and they opened salons in 4 cities in Japan, including Fukuoka, Kyoto, and Tokyo. The number must be more now. 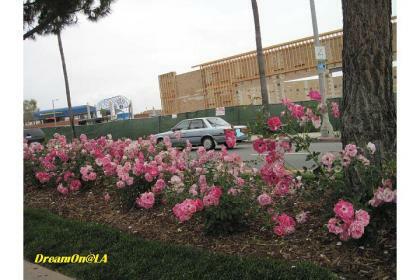 Rose flowers were beautiful in the center divider near South Bay Galleria, Redondo Beach on my way there. 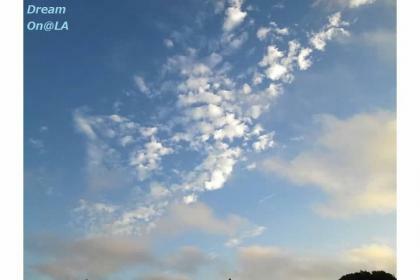 The Movie, "Gaia Symphony No.6" will be screened in Irvine on Thursday, May 19, 2011 from 6 pm. A ticket is $10 per person. All proceeds will be sent to UNICEF （Japan Disaster Fund), so please send a check ($10 times number of tickets), payable to UNICEF （Japan Disaster Fund) to Fumiko Ishii, C/O Irvine Valley College, 5500 Irvine Center Dr. Irvine, 92618. Yard Sale for the Japan Relief Victims with Handicapped. Thousands of people around the world in more than 50 countries will gather and pray for world peace. The prayer originates Mt. 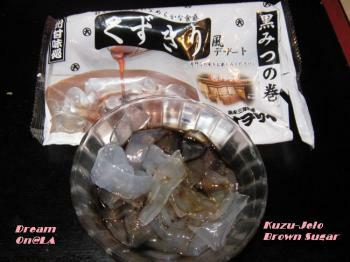 Fuji and circulate around the glove 24/7 by gathering and by Internet prayers. I'm visiting Japan to participate this event at Mt. Fuji and a high school reunion. You can participate by Internet as well. 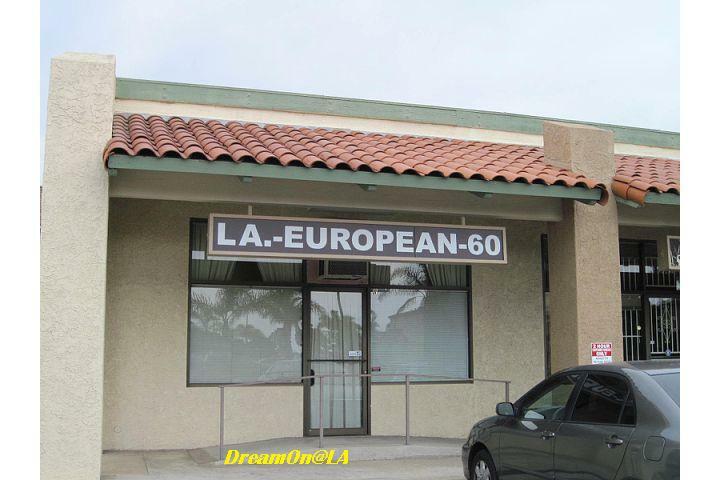 In Gardena, CA, there is a branch office. SOPP will be held on Sunday, May 22, 2011 from 11 am to 1 pm. Admission is free. No reservation required. "Soft Gel Manicure": They last at least 3 weeks without chipping or washed out. I tried it for the first time a few weeks ago at "Calty Salon" in Gardena, a suburb of Los Angeles. 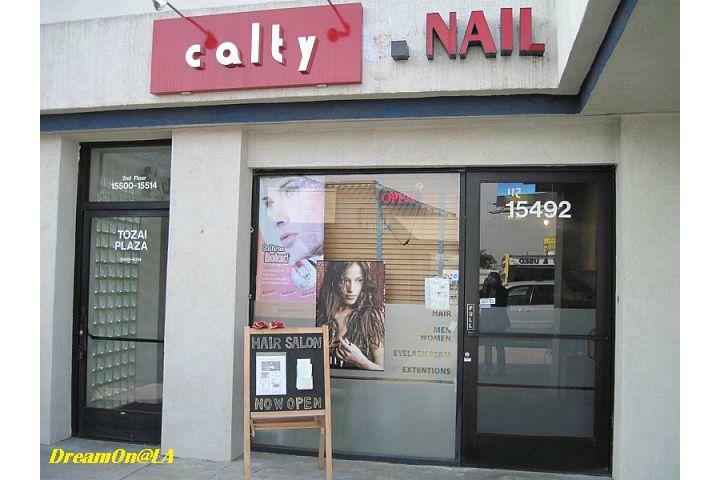 "Calty" is located in Tozai Plaza in Gardena where "Kiraku Ramen House" in the previous article is located. 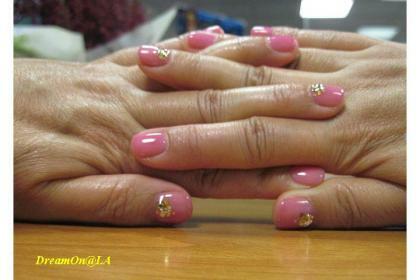 I asked the manicurist KIKO to apply Golden Sparkling art on nails on Thumb and Middle Fingers. 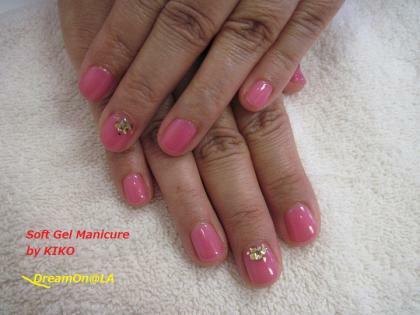 KIKO is a certified Instructor at Japan Manicurist Association. She taught for 4 years at the Manicurist School of "Eriko Manicure", a famous and charismatic manicure salon in Tokyo, Japan. 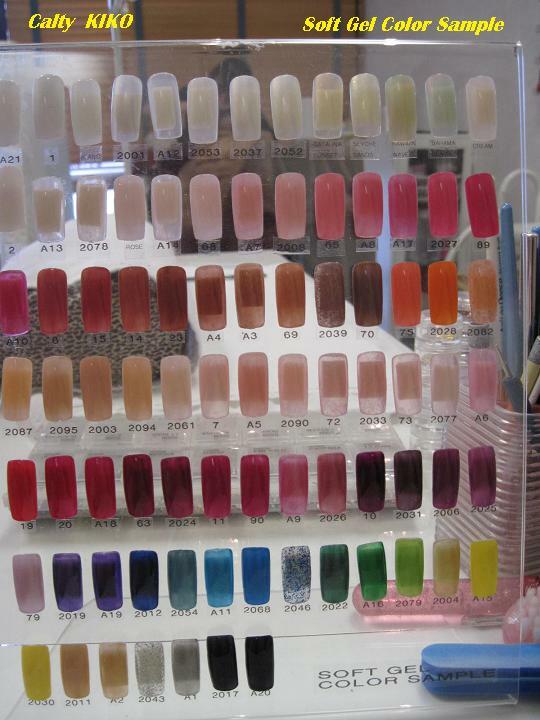 According to KIKO, Gel Manicure was first developed and practiced in South Africa. I did not know. By the way, I'm visiting Las Vegas, NV this weekend from Friday, Feb.18, 2011. It was supposed to rain with 80% chance of rain from Friday night to Saturday all day. It was gloomy Saturday morning, but it became sunny from around 10:30 am. We are happy for the good weather. We plan to visit "Valley of Fire State Park" on Sunday. 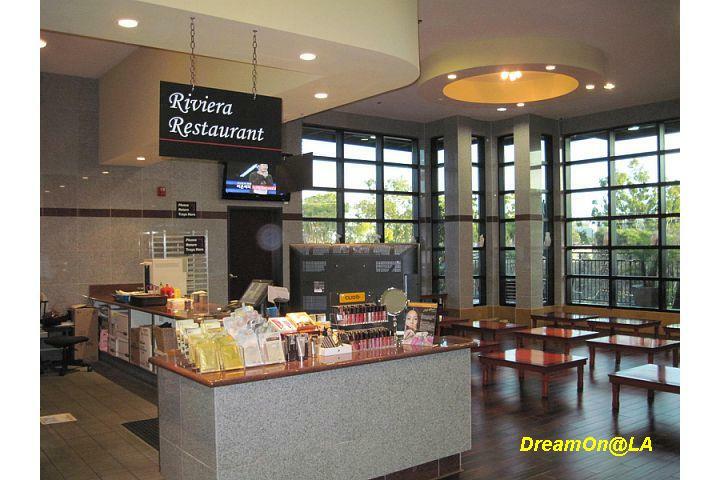 We are enjoying several "Buffet-All-You-Can-Eat" meals in Las Vegas. I will post them on my blog upon my return to LA. My Mini-book PC mouth got broken. It takes time to use the square mounted mouth on the Mini-book PC. 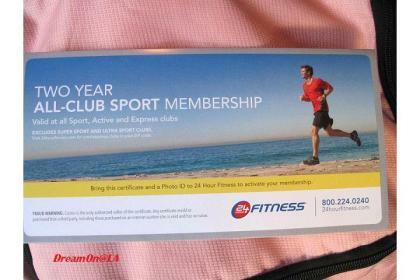 "24 Hour Fitness": I became a member of the club yesterday. It's open 24 hours, 7 days a week. My long time membership at "Bally's Fitness" expired on Jan. 4, 2011. I was a member with Bally's Fitness for more than 15 years. The annual fees increased little by little and became over $200. It was time to quit. 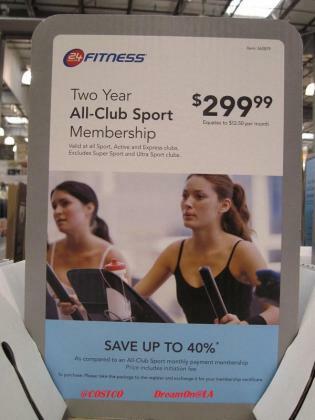 As a result of my Internet search, "24 Hour Fitness, 2 Year, All Club Sport Membership at $299 " sold at COSTCO was the best deal. You can buy it at COSTCO store or On-line store. After paying at COSTCO cashier, they gave me the official membership document. 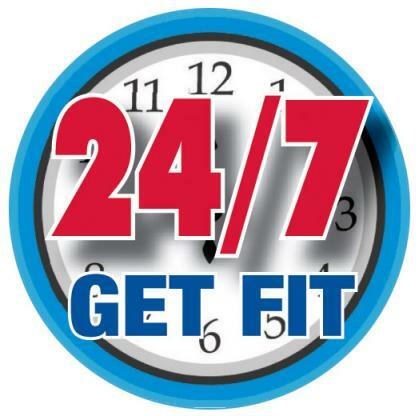 Your 2 year membership will be effective from the date you bring it to your local "24 Hour Fitness" club and signed up. 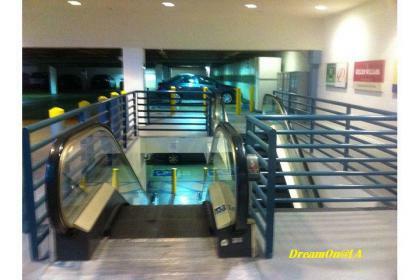 There is a free parking in the rear Parking structure. "Pacific Movie Theaters" used to be in the building. 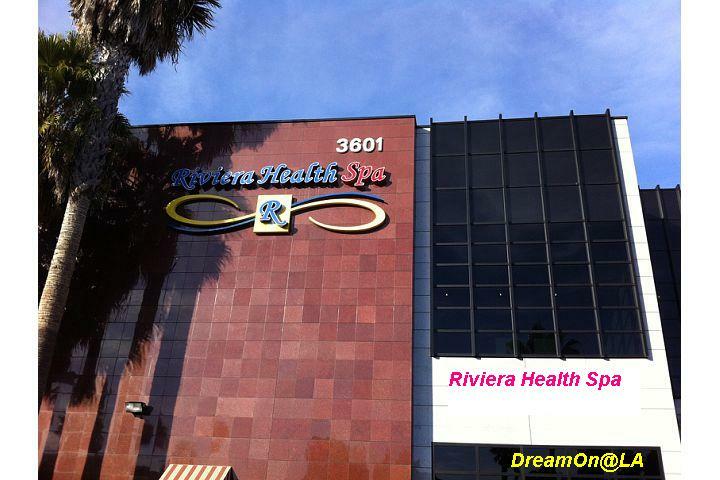 It's on PCH (Pacific Coast Hwy) at 16th Street, North West corner building. There is a VONS market little south. It's between Artesia and Aviation. I signed up for the 2 year membership. The staff gave me a tour of the facilities at the club. I was recommended to take personal trainings. 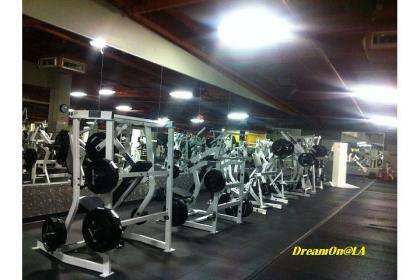 They give 50 minutes X 3 sessions free for new members. The catch is you need to buy 50 minutes X 5 sessions at $327 or 25 minutes X 5 sessions at $199 on the day you sign up or within 2 to 3 days. They have Dry Sauna, Steam Room, Whirlpool, and Swimming Pool as well. A part of spacious workout room. 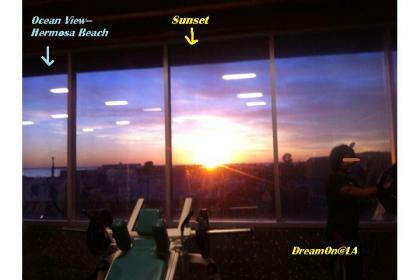 I saw the sunset and the Pacific Ocean from the West side windows. I just paid $299 for 2 year membership. I told I will think about it for a few days, and worked out and went home. 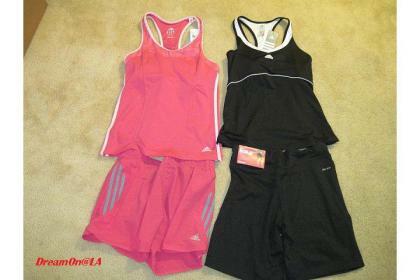 Target~ I will loose 2 pounds per week and 16 pounds (7.2 kg) in 2 months! 24HourFitnessInc--November 20, 2009--Part 1 of the Trainer Tips series. Some useful tips on how to achieve your weight loss goals. I just searched Costco.com and found "24 Hour Fitness 3 X 50 Minutes Personal Training $79.99". I will probably take this later. It's a good deal. Braco was in Los Angeles until 10/18/2010. We went to his gazing session on Saturday, 10/16/2010..... There were hourly sessions from 9 am to 4:15 pm, and it was $8 per session. We lined up at the line in front of the ballroom at Marriott LAX Hotel from 8:30 am. The hall door was opened at 8:58 am. 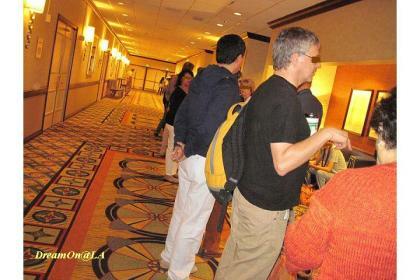 About 200 people were admitted to 9 am session. My friend Joy and I got seats in the third row from the front in the center. 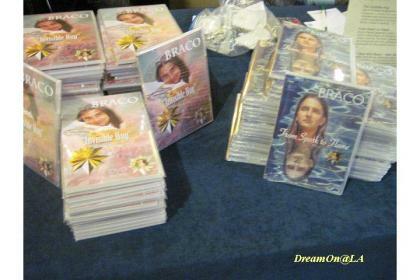 The producer of Braco Gazing appeared and explained about Braco and showed some clips form the most recent Braco DVD. Then, everyone was instructed to stand up and Braco appeared for gazing from around 9:25 am. There were many audiences holding photos of their loved ones, friends, and pets there also. 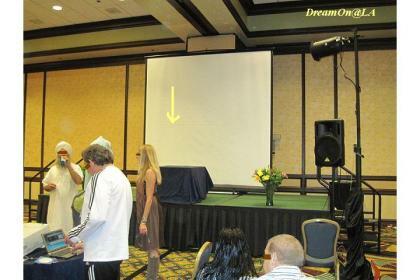 Braco stood on a 4 foot high step placed above the stage. We were told to power off cell phones because the cell phone frequencies interfere with Braco's healing power. 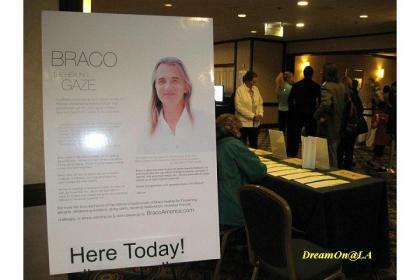 Braco moved his gaze slowly from center, left, center, right...etc. for some cycles for about 9 minutes. His eyes are gentle and cute like a kid. He uttered no word. He quietly stepped down from the step and walked back from the stage to the back room. I heard he is 41 years old now. Some staffs were watching us, so I did not take any photos nor video clips of him. The producer asked the audience how we felt and how it was. 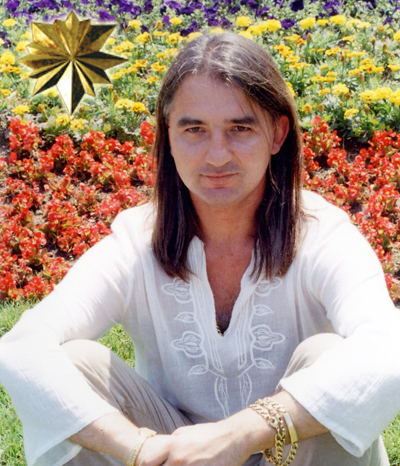 A guy around 20 years old who sat in front of me said he saw golden aura around Braco. 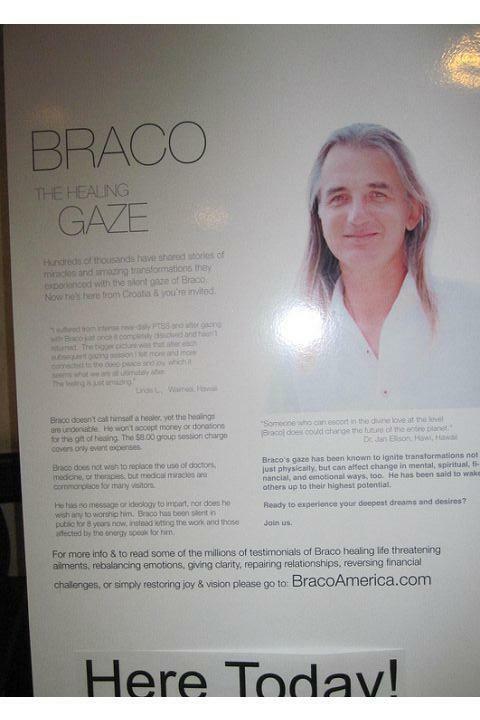 He also went to Braco's gazing session in Las Vegas a few days prior to it. 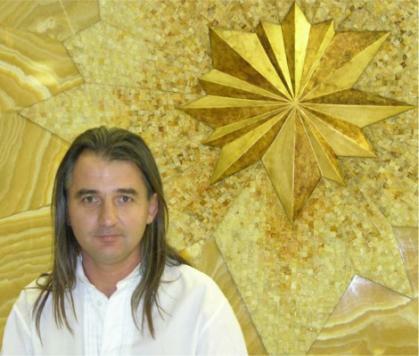 My body felt warm while gazing Braco. 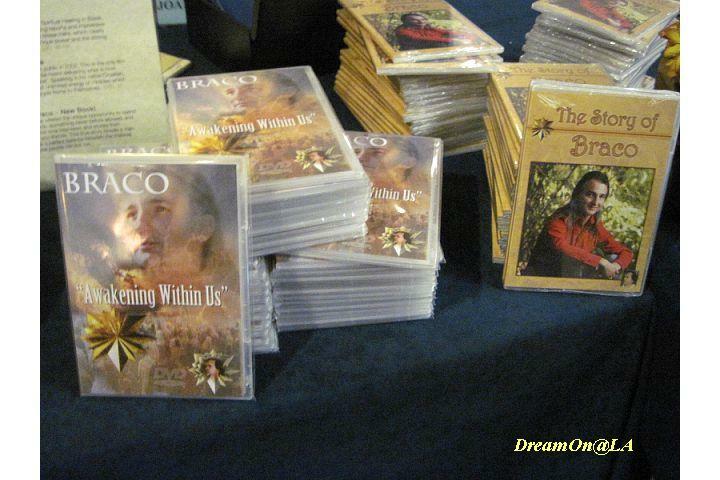 I purchased two DVD on the far right, "The Gaze of Light" and "The Golden Bridge". One was filmed in Hawaii and the other was filmed in USA this year. Other DVDs above were filmed in Croatia. They have English dubbing or subtitles. I returned home around 10:30 am. I got sleepy and fell asleep until 2:30 pm. I feel sleepy ever since. Usually I need only 4 hours of sleep a day, but I've been sleeping 7 hours a day ever since. 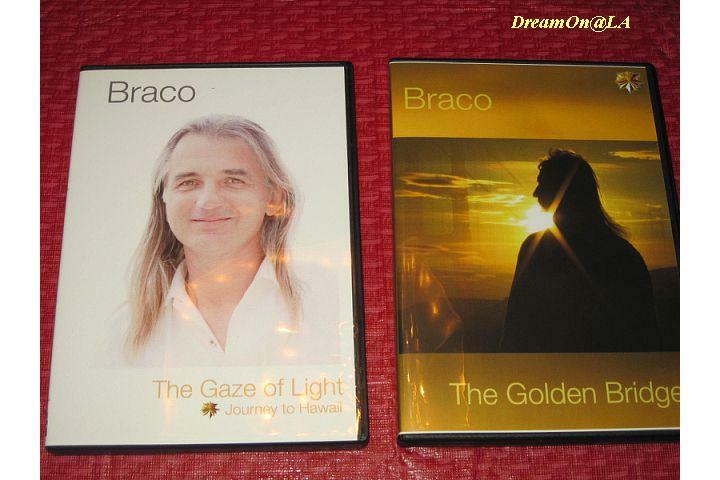 A 51 year-old lady in the new DVD "The Golden Bridge" said that she went to Braco's session last April in LA in a wheelchair as a last hope. She had a grapefruit size tumor in her brain. She could not walk. 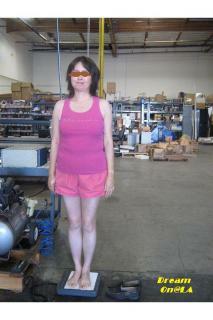 She was very ill.
A month after Braco's gazing session, the tumor shrunk 80 percent to a size of peanut. 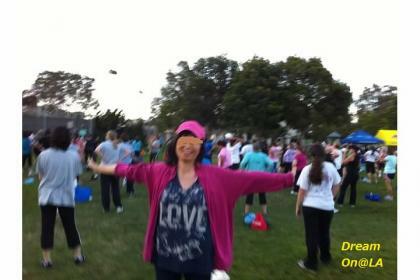 A few weeks later, the tumor disappeared and she was cancer free. I have large lumps at 3 inch diameter and 1 inch diameter, etc. in my breasts from 5 years ago. I wish they will disappear. 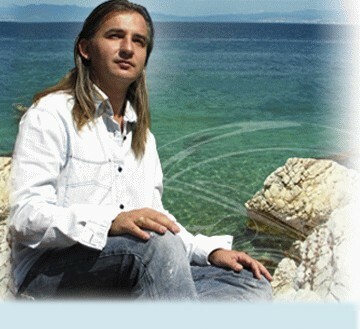 Braco is in Los Angeles now. Are you ready to gaze in a new world? Tickets at the door starting at 8:15 AM before events and online. Tickets are sold at 1 hour interval. Each group of people will have a chance to stand in front of Braco for gazing session for about 5 minutes. Tickets are sold at $8 each. All gazing at Agape is for a suggested love donation of $8.00 No pre-sale tickets for Agape gazings will be sold. Come early to ensure entrance. 6:55 AM, 9:00 AM, 11:30 AM during services with two special program gazing sessions at 3:00 PM & 4:30 PM in the sanctuary. Meditation is 30 minutes prior to each service (6:25 AM, 8:30AM & 11:00 AM) so come early & dive in deeply. For those who cannot attend the live sessions ($8) can attend "live streaming gazing sessions ($2)" via Internet at 3:00 & 4:30 PDT on 10/17/2010 via Agape’s live streaming link. These two live streaming gazing sessions are stand alone events. I could not believe Gazing alone can heal sickness and pains at first. But looking at his merciful face on Youtube, I want to see him. I will go to Braco's morning gazing session tomorrow and add my review here later. "Ikeda Chiropractic Rehabilitation Center": I have been getting spinal adjustments here 3 times a week for 4 weeks since the car accident. 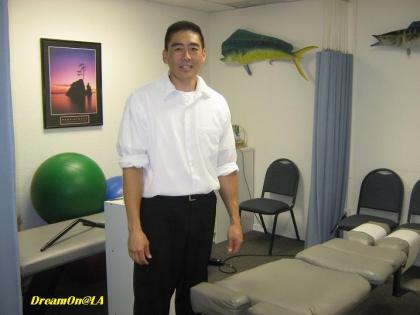 The doctor of Chiropractic office is Cliff Ikeda, a 4th generation Japanese American. 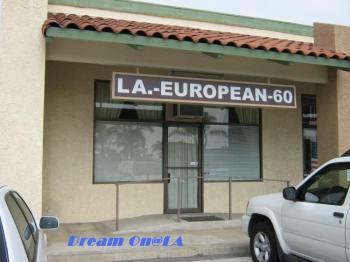 The office is located in Torrance, along Crenshaw Blvd., little south of Artesia Blvd. Cliff took some X-ray shots on my first visit and showed the X-rays to me right away. My neck bones were crooked to the left in the middle and my shoulder bones were distorned on both sides. May be because the impact was from the right side at the car accident. Cliff told me on average, people in similar car accident cases will visit the chiropractic office 12 to 14 times. Older people will usually take a year to get it healed. 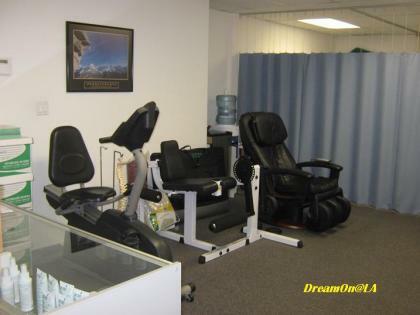 When he is busy with another patient, I am put on the deluxe massage chair and get a massage for the entire body. It's pretty good, too! 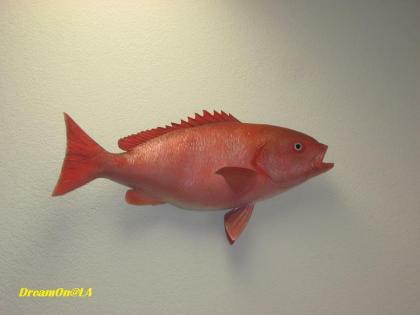 There are several big fish figures from fishing. Most of them were caught by his grandmother. 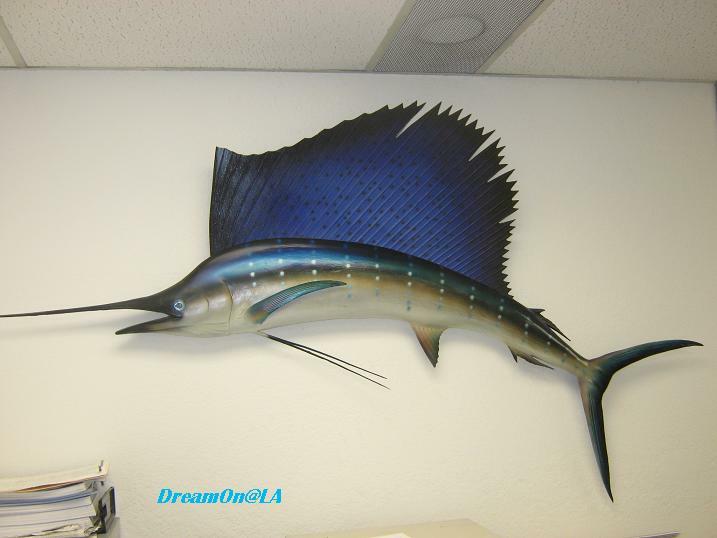 There are 4 Chiropractic Colleges in California--2 in Southern California and 2 in Northern California. The course is equivalent for 5 years of college studies but done in 3 and a half years without summer vacation, 7 weeks off and 45 weeks of classes in a year. It will be 12 years this December after he started his practice, and it's been 8 years since he moved his chiropractic office to Torrance. It was my first chiropractic experience. Twisting neck bones and the spinal, so called "adjustments" were pretty amazing at first. The pain and tingling on my neck, shoulders, and lower back reduced very much compared to my first visit. I plan to visit the office little longer. 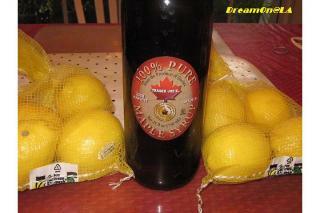 "Lemonade Fasting-The Master Cleanse Diet" Last month I tried a "7 Day Lemonade Fasting" and succeded with Weight Loss. I will report on the details below. This diet is used successfully by many Hollywood stars in the past to lose weight in short period. The diet comes from a book, "The Master Cleanser", published by Mr. Stanley Burroughs in USA in 1972. Had Only Lemonade for Meal. I had hot Herbal Tea. 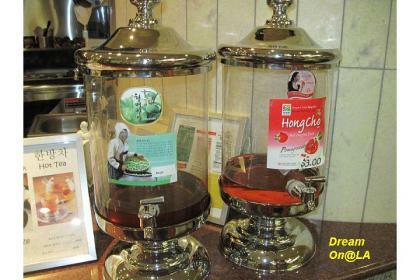 If you drink hot Herbal Tea before you go to bed, it will make your bowel movement easier next morning. On top of Lemonade, I drank lots of Water. For Breakfast, I had Diet Herb Tea (sold at Chinese Market). I had Lemonade for Breakfast, Lunch, Dinner and anytime I felt hungry. I had about 4 bottles (500 ml ). 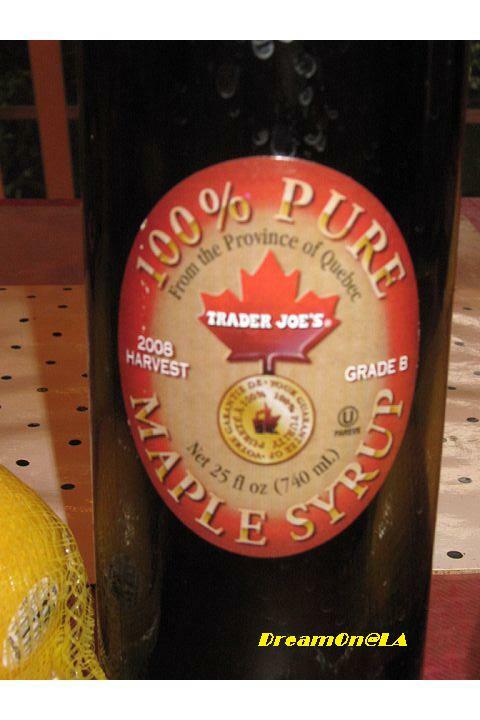 I used Grade B Maple Syrup (sold at Trader Joe's). Grade A is filtered out too much and there are not much minerals. Grade C is the best, but I could not find it. 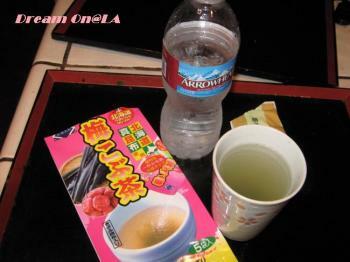 For Breakfast, I had Diet Herb Tea (sold at Chinese Market). I had Lemonade for Breakfast, Lunch, Dinner and anytime I felt hungry. 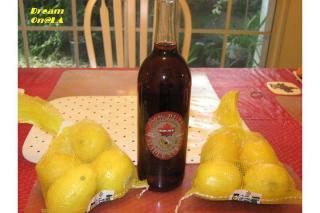 I had about 4 bottles (500 ml ) of Lemonade and some cups of hot herbal tea. I felt fatigue from the morning. It was hard while working in the office all day. It's the "Devil's 3rd Day". I heard the 3rd day is the hardest, because toxins are being released from your body. I tried to believe it will be better after I pass this stage. I had only Lemonade, Herbal Tea, and Water. I got very sensitive to smell. I felt sick when others in the office were eating lunch near-by. Especially slight hint of Garlic was the killer. It's much better than the previous day. I had only Lemonade, Herbal Tea, and Water all day. 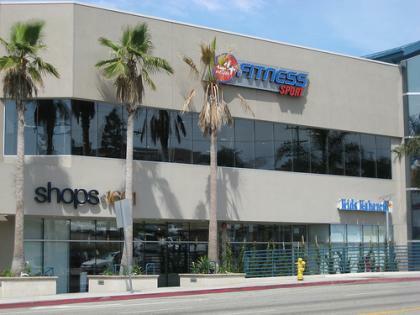 I exercised 30 minutes walking/jogging and another 20 minutes bicycling at the gym. Saturday. I thought I might faint by fasting for 4-5 days, but it was not like that. I was full of energy, and I felt good. I had only Lemonade, Herbal Tea, and Water all day. Sunday. It's getting so easy. I was forgetting that I was on fasting. I went out to some events and did some walking exercise. I had only Lemonade, Herbal Tea, and Water all day. The Weight Loss Stopped! But I felt so "Light" and much easier to move around and my skin was getting more beautiful. I had only Lemonade and Water all day. I exercised 30 minutes walking/jogging and another 20 minutes bicycling at the gym. I wanted to continue some more days, but I decided to quit here by thinking about my current plans at work. As a recovery food, I had freshly squeezed Orange Juice by making it bymyself. 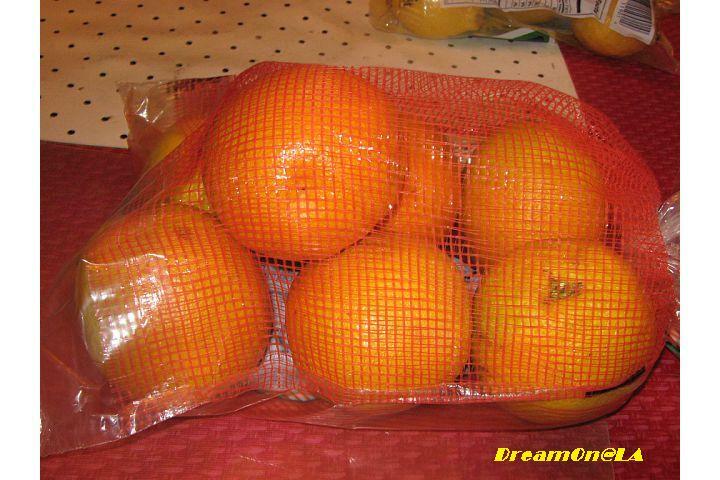 I had Valencia Oranges cut into slices. I also continued drinking Lemonade, because it tasted so good! "The Biggest Loser Challenge II" ended. 4 people at work participated for 12 weeks from 7/29/09 to 10/21/09 by paying $40 each. We competed on the total weight loss percentage. The winner got all the money--$160. This "Lemonade Fasting" diet should be followed for a minimum of 10 days or more - up to 40 days and 3 to 4 times a year. 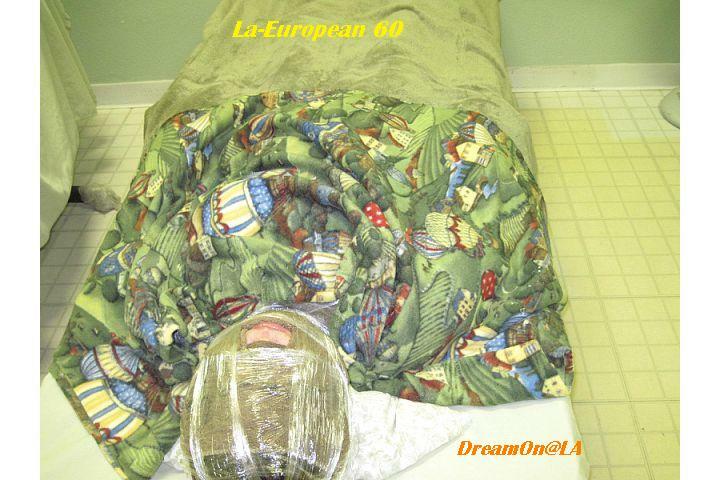 Last Friday, 6/19/09, I tried "European 60 Body Wrap." I tried this for "Belly, Back, and Legs" course for 4 times 7 years ago. 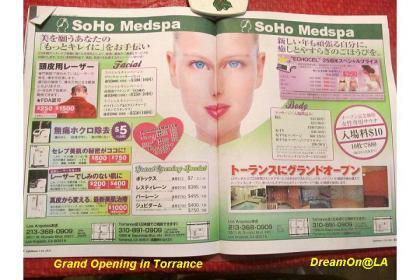 There was an ad and a diet special article on a local Japanese Magaine, "l'ovest" May issue about this salon. 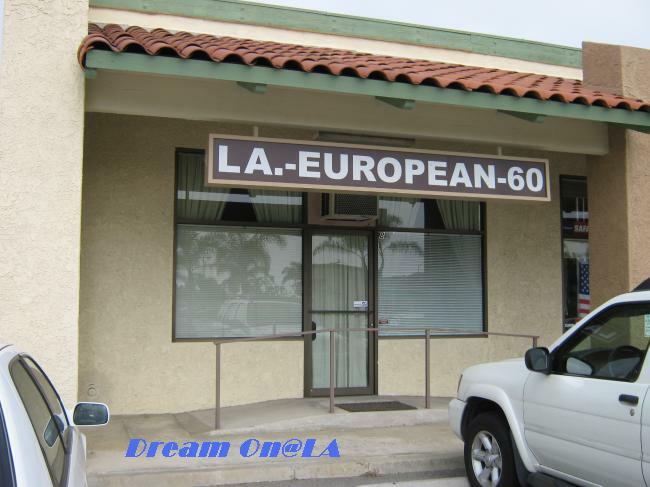 It used to be in Gardena, but now it's in Torrance, on Artesia Blvd. It's close to my house. An ad on "l'ovest" May issue on page 20. Early Summer Special from 5/1 to 7/31/09. This time I tried "Whole Body Wrap." Two people wrapped my body with bandages made of towel and soaked in natural herbs and mineral solution from my toes. The herb and mineral solution is warm. After wrapping with the bandages soaked in herbs and mineral solution, they wrap the portions with plastic wraps over and over before they get cold. When they wrapped belly and lower back, it was wrapped while holding up the excess fat around the belly. My arms were wrapped, too. The 23 kinds of natural herbs and 8 kinds of minerals will make the fat cells smaller and release wastes deposited in body. It also nurture and fasten skin, and reduce body sizes. I asked to take measurements before and after the body wrap. My waist got 1/2 inch (1.3 cm) down, and my under waist got 1 inch (2.5 cm) down. I tried not to sweat too much for 2 days and measured at home. My waist was 2 inches (5 cm) down and under waist was 4 inches (10 cm) down. 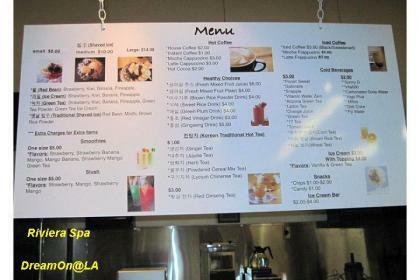 I asked the owner, Kathy to take my photos. 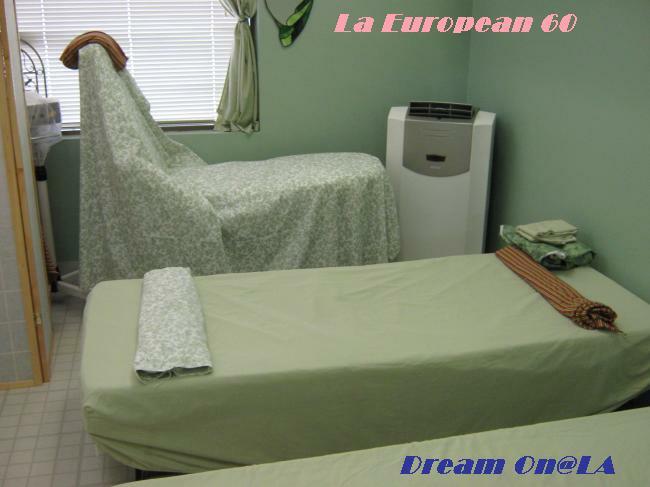 She said there are many people who come from Japan to learn her "European body wrap" method and they opened salons in 4 cities in Japan, including Fukuoka, Kyoto, and Tokyo. "The Biggest Loser Challenge" ended. 12 people at work participated for 20 weeks from 2/4/09 to 6/24/09 by paying $20 each. We competed on the total weight loss percentage. The winner got all the money--$240. The result was: First-LD (Male 11.26%), 2nd-Lisaky (8.8%), 3rd-EE (Male about 8.5%), 4th-LN (Female 8.1%), and 5th-CS (6.3%). I interviewed LD on his strategies to loose weight. He said, "Eating less every day and exercising every day. I stopped drinking alcohol for 2 months. 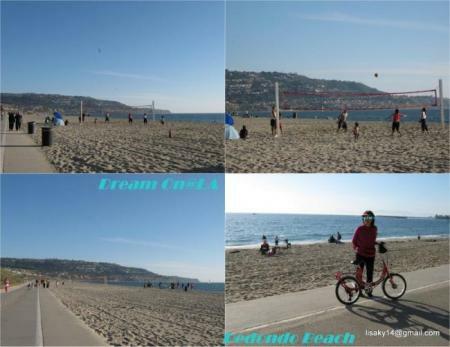 I did bicycling and valley ball for exercise." To my colleague LD,Congratulations and hats off to your dedications and hard works. You did it !!! Thanks for your supports for 20 weeks during this diet challenge. Although, I came in 2nd and did not win, I am happy to loose 8.8% weights while eating out here and there and drinking wine. I tried "European 60 Body Wrap" last Friday for the 1st time in 7 years. It helped me reduce fat around my lower waist for 16 cm (5.5 inches). I will write about it on my next blog. 12 Volunteers at my work started "20 Week The Biggest Loser Weight Loss Challenge." It started from 2/4/09 and will end on 6/24/09 in just 2 days! The winner would be the one who has the highest percent weight loss (weight lost/original weight x 100). The participation fee is $20 each person and the winner gets all the money ($240). Every Wednesday, we weighed in and my coworker NU emailed each participants on the weight and progress. 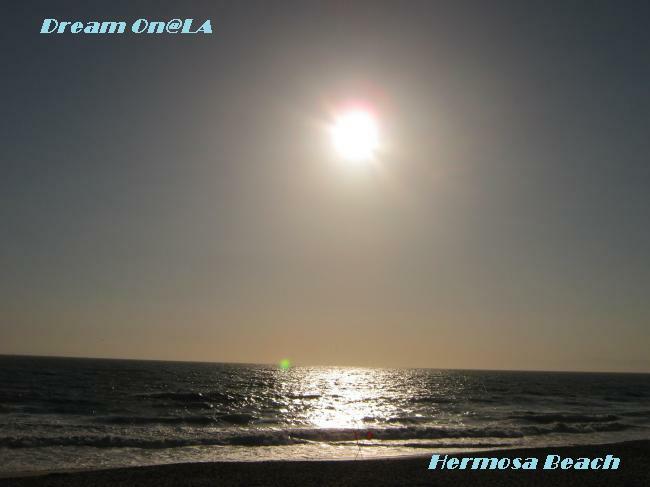 A Sun at Hermosa Beach. 6/21/2009 6:35 PM. My result of weigh-in on 6/17/09 was 4th place. 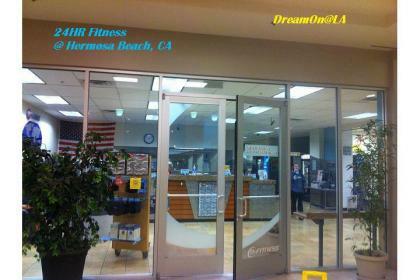 The 1st through 3rd were LD (male), EE (male), and LN (female). I slumped at the same weight for 8 weeks until 3 weeks ago. Until 2 weeks ago EE was in the top place for 8 weeks or so. I heard he ate only a canned soup once or twice a day. I don't know what LD, who came in top in the last few weeks, has been doing. I decided to "fast for 48 hours" from 7 PM on 6/19/09 to 7 PM on 6/21/09. 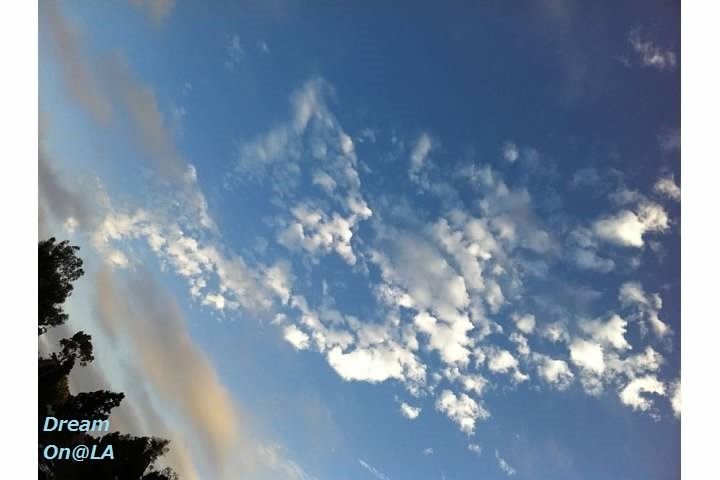 There was a "Global Link Teleconference" and "24 Hour Internet Marathon" on June 21st Solstice Day, sponsored by "World Peace Prayer Society" to pray for peace of each country and to show our gratitude to Waters. I read in some book that it's effective to do fasting for a prayer. I can kill 2 birds with 1 stone! I cordinated my fasting toward that world peace prayer. While I was fasting from Dinner on 6/19 to Lunch on 6/21/09, what I had was Water, Water, Water, and a cup of "Plum Kelp Tea" a day. Photo taken on Hermosa Beach Pier. 6/21/2009 6:42 PM. During fasting, on the 2nd day, I kept dreaming of melted "Chocolate" over and over. I felt fatigue and I had no energy. I weighed in, but there was not much difference. I took a "Bikram Yoga" class at Hermosa Beach from 3 PM on that day. I almost fainted 6 times during the hot yoga. After fasting, my first food was "Jello with Brown Sugar Syrup." The next food was "Black Cod Soup Pot with Tofu and Spinach," "Cold Tofu," "Seaweed Rice," and "Natto Beans" for Dinner. The current local time is little before 8 AM on 6/22/09. It's only 54 hours until the final weigh-in on 6/24/09 at 2 PM. Then, the winner will be decided. I may not be able to be the winner, but I will try my best to become my target weight and percentage loss. 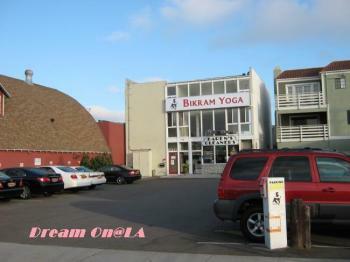 I went to "Bikram Yoga" from 5:30 AM this morning as well. 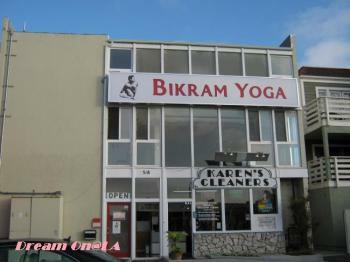 From yesterday, I have been challenging "Bikram (Hot) Yoga." It was my 2nd time this morning. 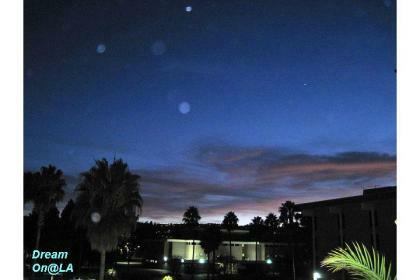 I have been taking the first class every morning, from 5:30 to 7 AM. I took a shower and relaxed in the steam room and came back home 5 minutes ago. It's now 7:49 AM on 6/18/09. "Bikram Yoga" is called "Hot Yoga," because yoga exercise is performed in a room temperature of 110 F (45C) or higher. It's heated even in the Summer time. 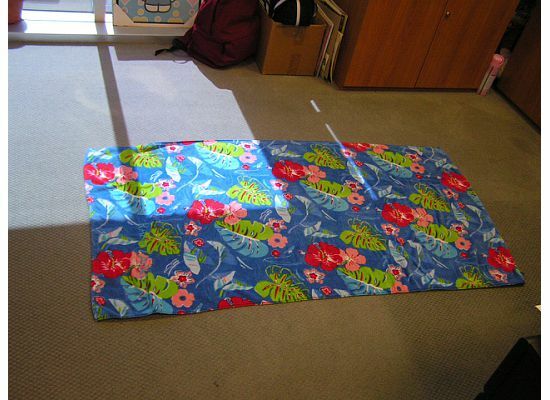 Each student brings Yoga mat, a large bath towel or beach towel, and 2 bottled water to the class. 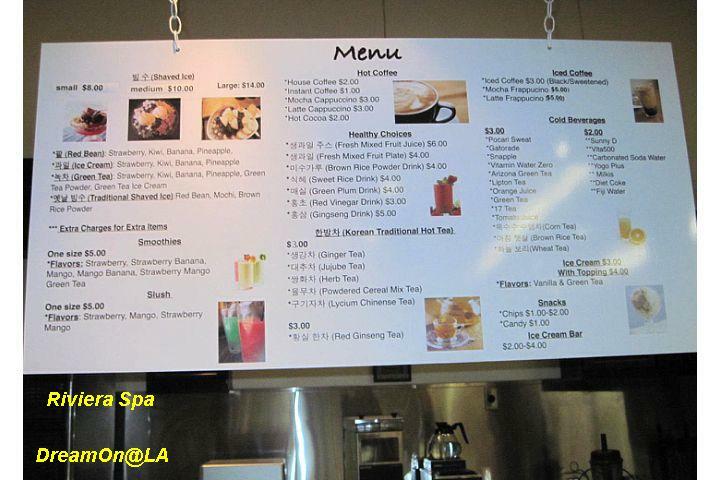 For the new students, they have $20 for 7 days, unlimited special deal. I am taking advantage of that deal. On weekdays, there are 7 classes starting from 5:30 AM to 8 PM. On weekends, there are 5 classes starting from 6:30 AM. All classes are 90 minute each. In the shower rooms, they have shampoo, conditioner, and body soap, and a hair dryer there. You need to bring your own bath towel. 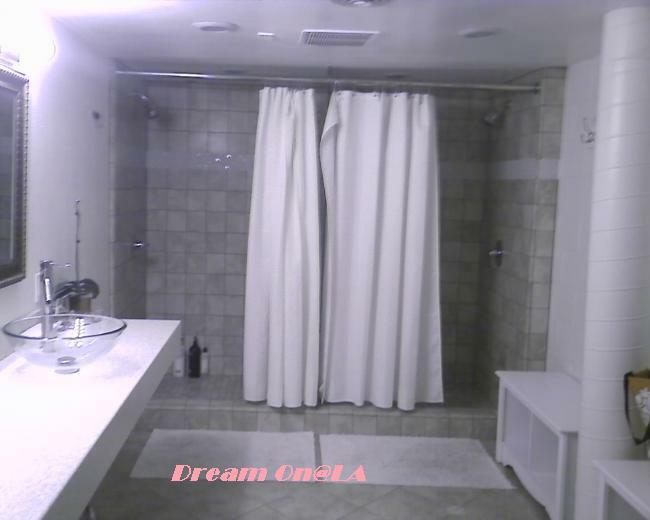 There were only a few people taking shower there. The steam room has a 15 minute timer. You need to turn that switch on. Steam will fill up the room in about 5 minutes. It's better you set the timer on before you take a shower. 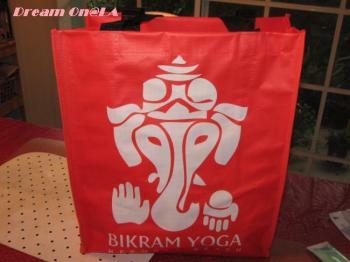 Bikram Yoga Eco Bag---It's handy to carry your staff to the class. When I signed up for the class, they gave me this bag for free. "Hermosa Beach Pier" is there on the same street. 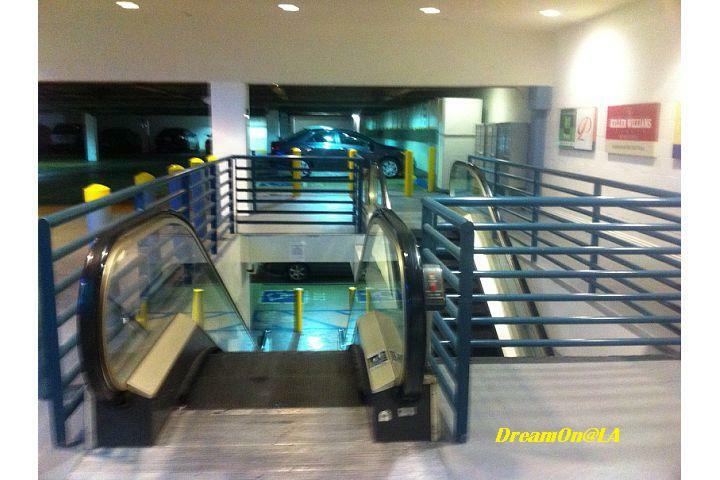 In the parking lot, the left half is for the cleaners, and the right half is for Bikram Yoga. 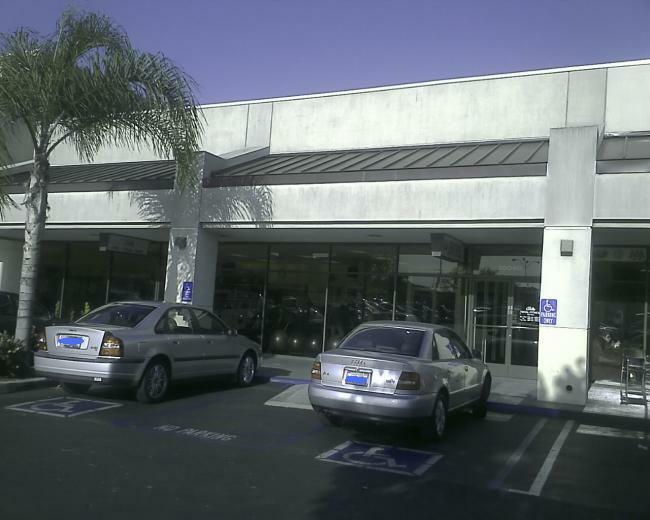 Bikram Yoga has 9 parking lot, plus there is a handicapped lot. At the clearner's side (10 lots), it's OK to park before 7 AM or after 7 PM or all day Sunday. 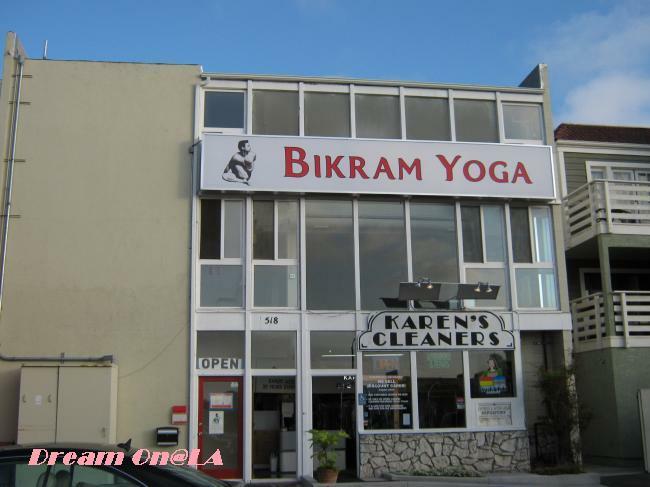 There is a dry clearner on the 1st floor, and Bikram Yoga is located on 2nd and 3rd floor. 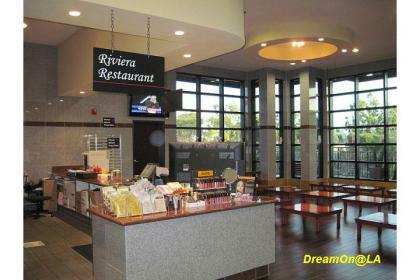 The reception office, change rooms, etc. 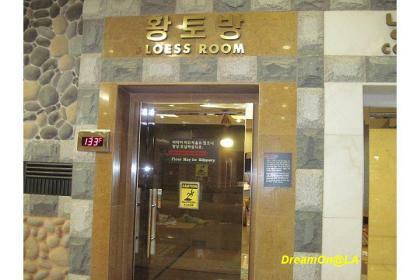 are located on the 3rd floor. 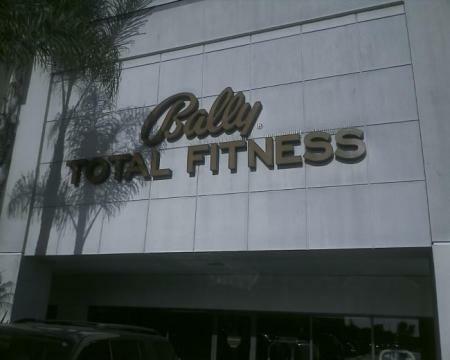 A week ago I hurt my lower back when I took another "Yoga class" at Bally's Total Fitness. 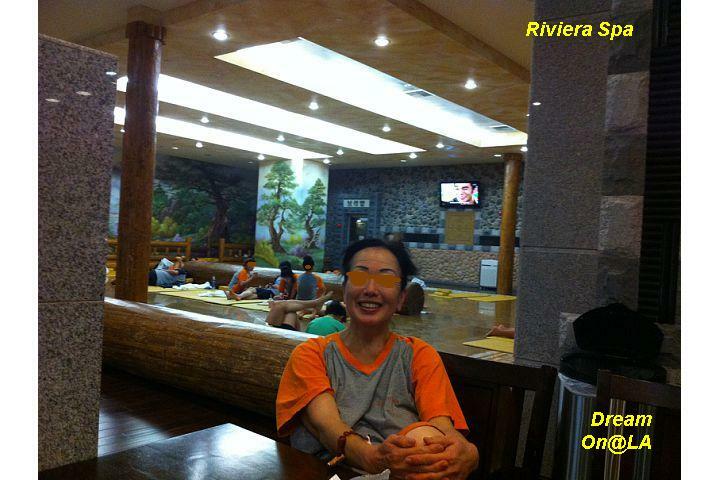 I did not take Yoga class for a while before that. I still cannot do poses to bend forward or arch my back like "Cobra" pose, because of the back pain. This Bikram Hot Yoga makes you sweat big time. 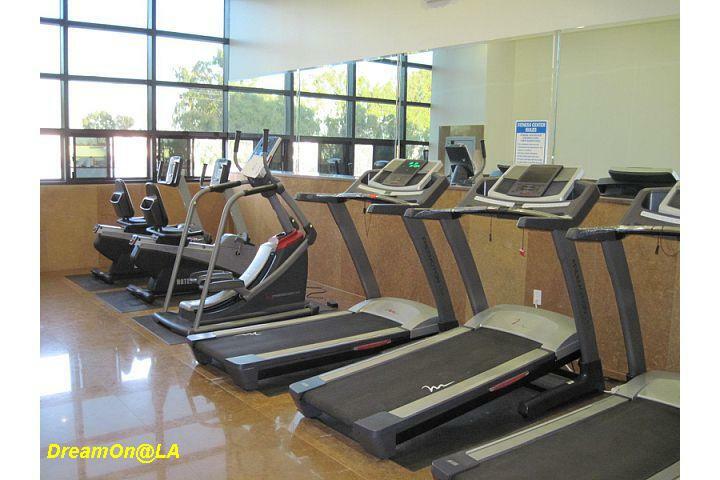 It seems better for your body compared to Yoga performed in an air-conditioned cool exercise room. 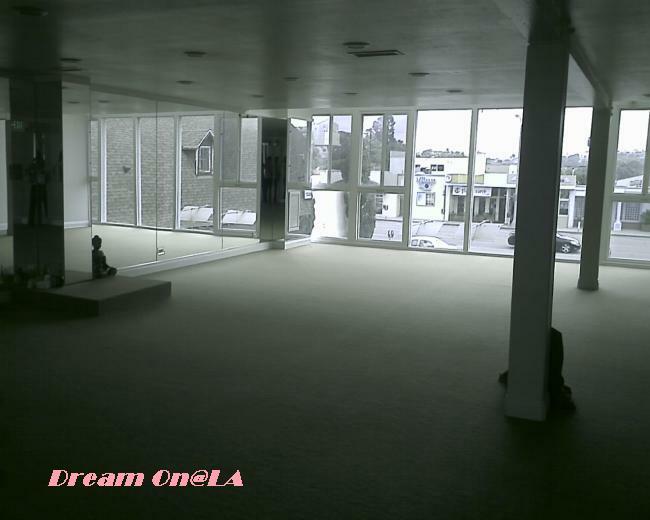 I plan to take 5 more days of Bikram Yoga classes the first class every morning. I might loose weight and get slimmer if I sweat this much every day. If you need to park in the metered parking lot near by, it's $2 for 2 hours in quarters. 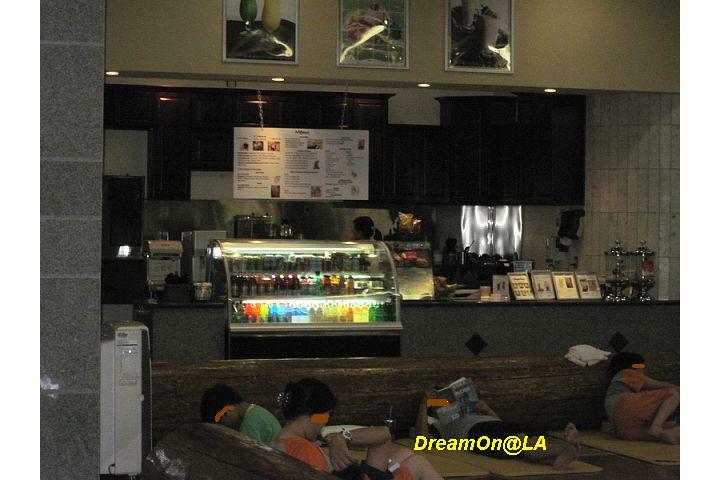 Also before doing "Bikram Yoga," they recommend not to drink Alcohol and not to take Caffeine. 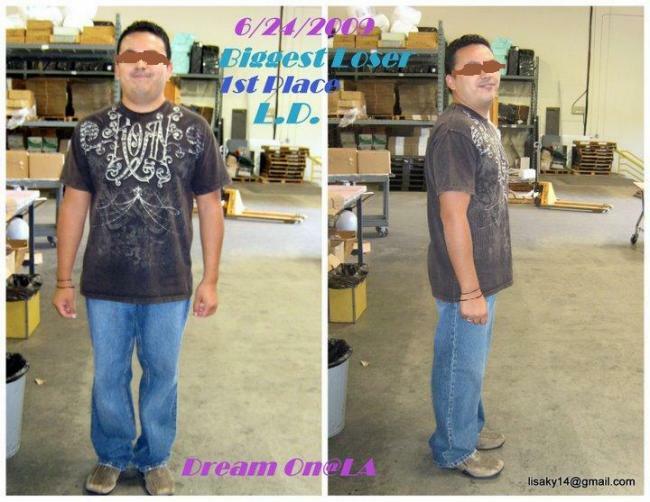 I am participating "The Biggest Loser Weight Loss" contest with 11 coworkers. We started it last February. The last weigh-in day will be June 24, 2009. It's just 5 more weeks to go. 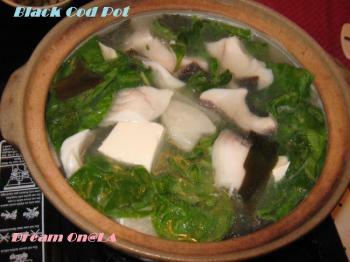 I tried "Drink Warm Water Diet", but I got bored after 3 days, because there was no taste. 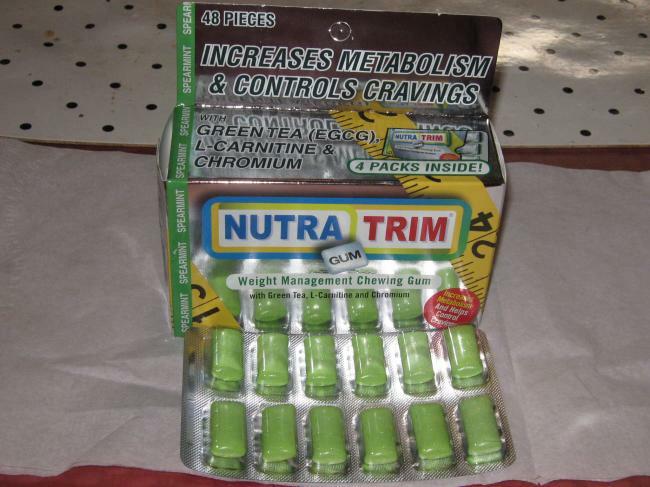 Last Friday I discovered "Nutra Trim Gum." It was in "Weight Management" section in a pharmacy. Direction says "For best results, chew two pieces of Nutra-Trim Gum at least three times per day. As with any weight management product, exercise and a balanced diet help to create a more effective program." 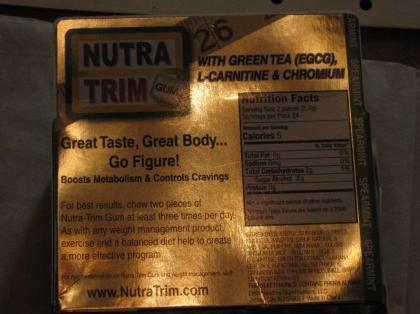 Major ingridients are Green Tea (EGCG), L-Carnitine, and Chromium. 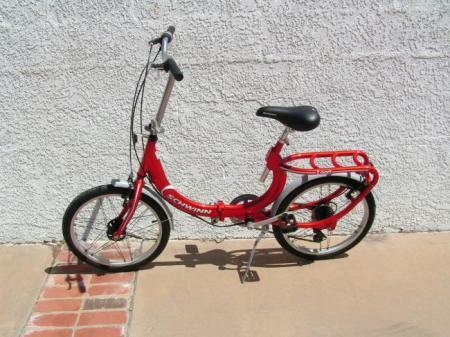 I purchased a Schwinn Low Loop 7 Speed folding bike. 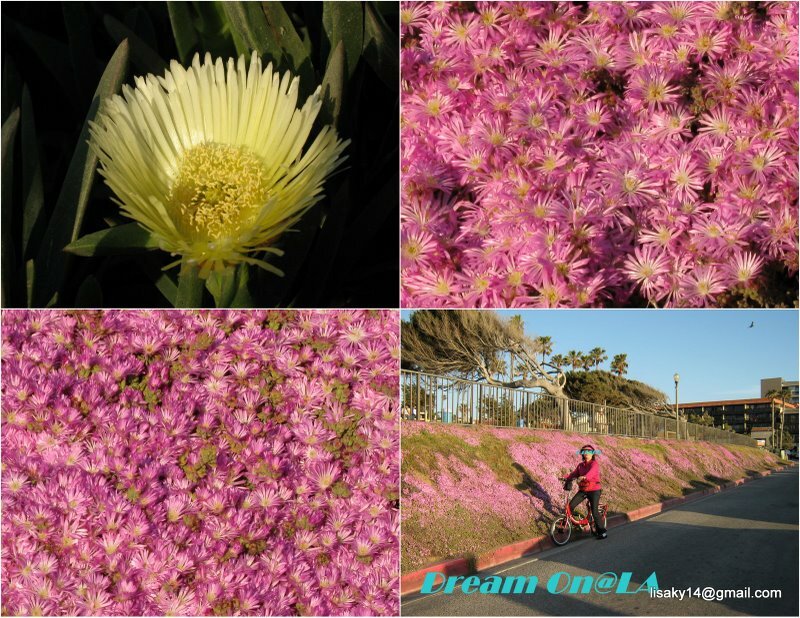 Last Saturday, 4/18/09, I took it to Redondo Beach Bike Road for a test drive in the evening. 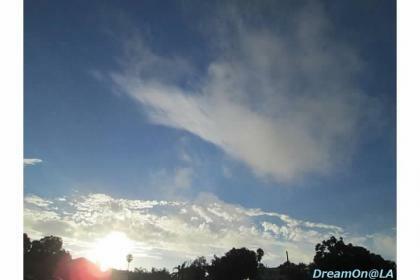 It has been hot like summer since last Saturday in Southern California. It was high 96F (36C) in Torrance, high 103F (39.5C) in Long Beach, and high 104F(40C) in Irvine last Monday, 4/20/09. There were lots of people on the beach, maybe because it got so hot that day. 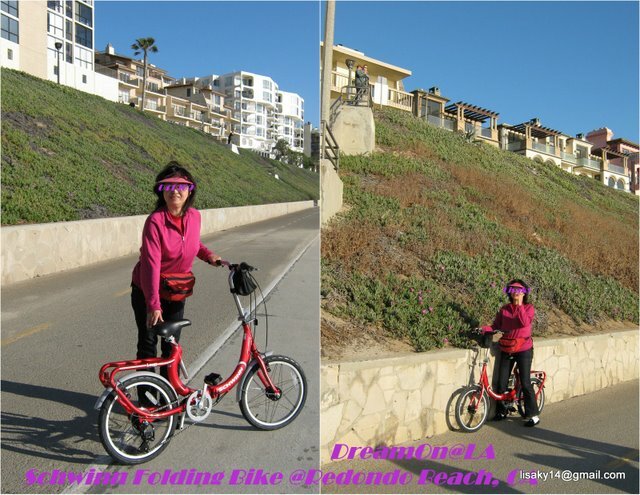 The test drive of the folding bike was good. 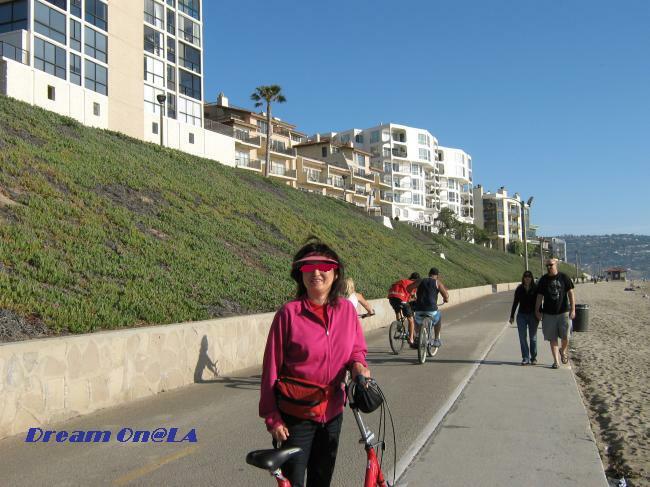 It's great and refreshing to cruise along the coastal line on the bike road on the beach! I cruised to the south end of the bike road near Rancho PV and came back to Redondo Beach Pier on a bike. I asked my friend MA who went there with me to take photos of me and the bike along the beach. 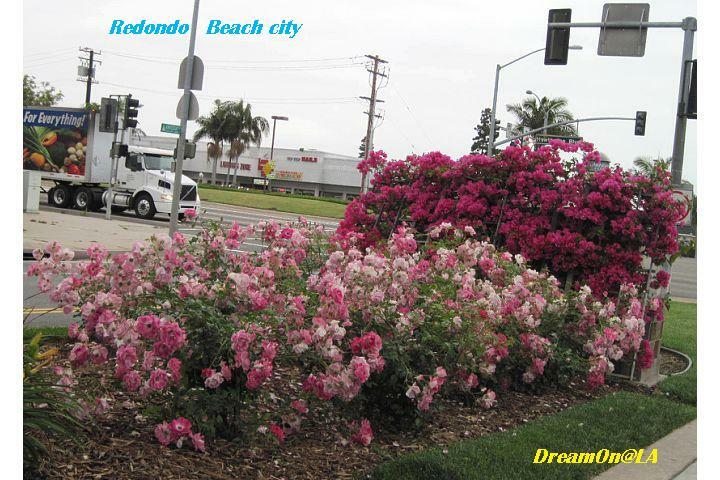 Bike Road at Redondo Beach. It continues from South Torrance to Santa Monica. It was very comfortable on my way there, but on the return, something was bothering..... My bottom hurt! Maybe because I rode a bike for the first time in years, or the saddle was hard, or the weights I gained over the years? 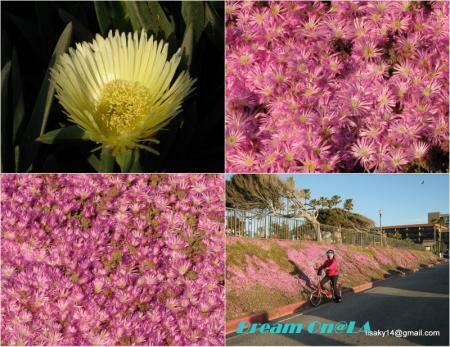 アイス・プラントの花が咲いてます。 Ice Plant blossoms can be seen now. I need to go look for a saddle cushion soon. The bike run was very good. It's upright design, so you can sit straight and don't need to bend over like a mountain bike. It's a low loop design, so it's easier to hop on to the bike for ladies. 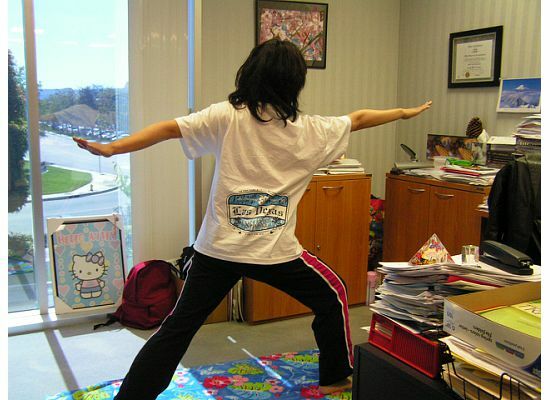 On 4/16/09, yesterday, I tried a "Boot Camp" for the first time. 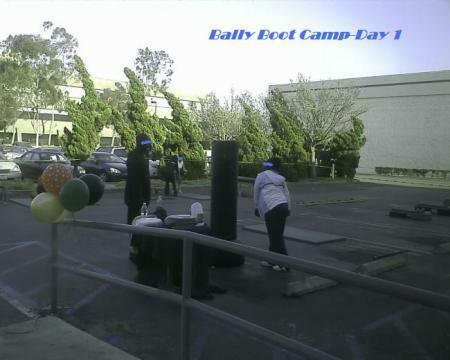 Bally Total Fitness is having "Bally's Boot Camp" from 4/16/09 to 5/28/09 on every Thursday. Gym members can partipate it for free, and it's allowed to bring one guest to the boot camp for free. The email flyer I received said, "The boot camp is from 5 to 8 PM, every Thursday." So, I left work early and went there little before 5 PM. Bally has many locations throughout USA. The one at Del Amo Torrance is just 1 minute by car and 5 minutes on foot from my work. It's 6 minutes by car from my house. I usually work until much later, but I hurried up and went there early. The boot camp started at 5 PM with 10 participants! They reserved a space at a part of the parking lot in the back by taping around that space with "Do Not Cross" yellow tapes. 4 personal trainers (2 males and 2 females) instructed the participants who teamed up as pairs, and the participants rotated the area. At a step, you will climb up a step, kick with one foot, and go down and do a squat. At boxing, you will punch and kick. On the mat, you will do push-ups and do weighted ball exercises. 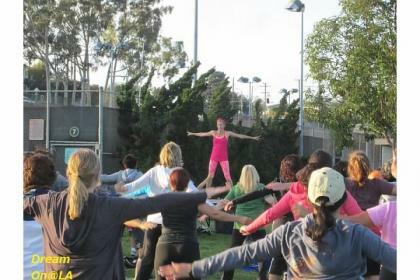 There were several other exercises with a fast pace for 30 minutes and rotated around. A boot camp finished in 30 minutes. People full of energy stayed and took another session continuously. 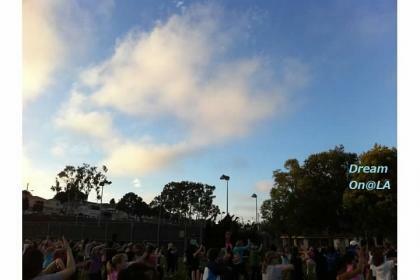 The boot camp started at 5 PM. A session was for 30 minutes. The last session started at 7 PM. Next time, I would like to attend it from 6 PM. After my boot camp session, I went to my car to pick up a cell phone and took some photos with it. I don't know how to set camera on my cell phone, so the photos are bad. Sorry. 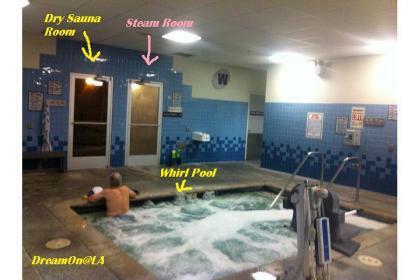 After that I ran on a tread-mill for 30 minutes and relaxed in a steam room. Probably I will get sore legs tomorrow...... I might have lost some weights? Here is our progress of "Biggest Loser Challenge" diet contest we are doing at work among 12 people. 12 people started this diet contest on 2/4/2009 with a fee of $20 each. 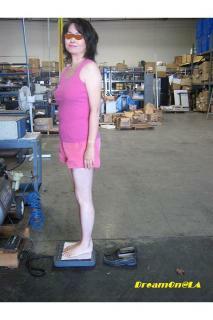 We are competing the total percentage weight loss for 20 weeks until 6/24/2009. The winner takes all $240. 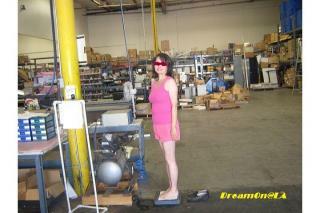 We officially weigh-in every Wednesday at 2 PM at the company's electric scale. My coworker NU emails the participants about top 3 and progress of each individual every week. Last week on 3/18/09, Top 3 were Lisaky with 5% total loss, LN, and EE (male). I must have got satisfied with that result. I went to dinner at "Buca Di Beppo" Italian that night. Last Friday, I went to "Tara Thai" Thai restaurant for lunch. 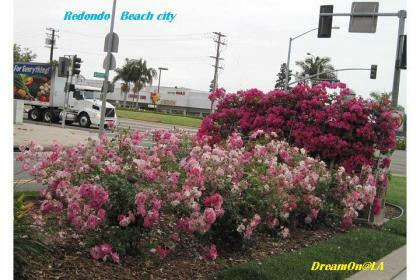 On Saturday, I had sushi lunch box to view Cherry Blossom and had a Strawberry Shortcake at Amandine Cafe. On Sunday we made Okonomi-yaki (Japanese pancake) at home for lunch and Paelea with Shrimps and Clams for dinner with Columbia Crest Reserve Cabernet wine. Last Monday I had Sushi, Sashimi, Salad, Udon noodles at Kai Sushi Sports Bar while cheering for WBC baseball championship game. On Monday, 3/23/2009, I took bath towel, T-shirt, leggings, free weights, resistant band to work. I started to do 20 to 30 minute Yoga exercise during lunch time. I do Cat pose, Sun-salutation pose, Yoga streching, sit-ups, and etc. From last Monday, I only eat fruits for lunch. 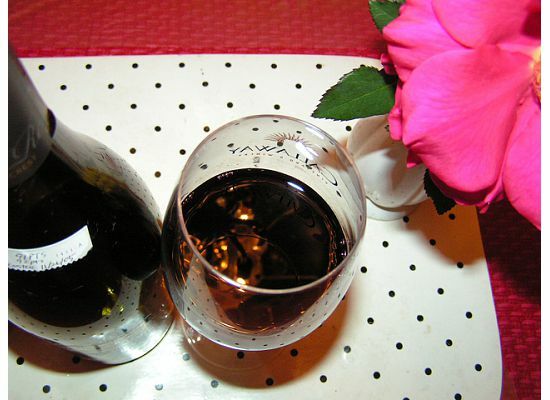 I wonder if I can make a toast with tasty red wine on 6/24/2009? 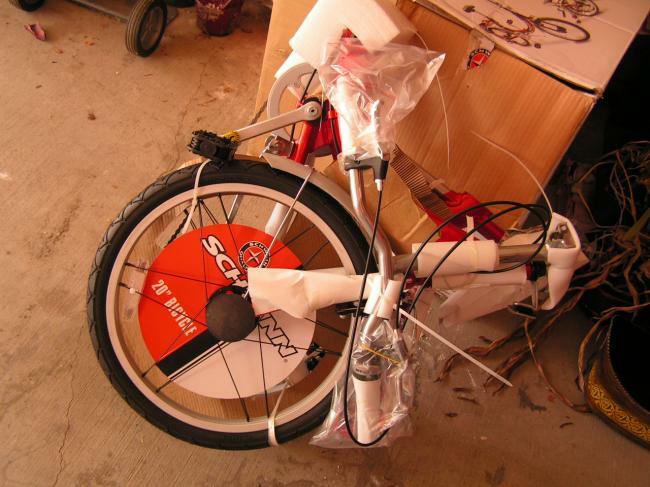 On 3/2/2009 I ordered a folding bike. 2 days later they cancelled my order because they did not have that item in stok. On 3/5/2009 I ordered another folding bike the same vendor was advertising. Next week they cancelled my order with the same reason. 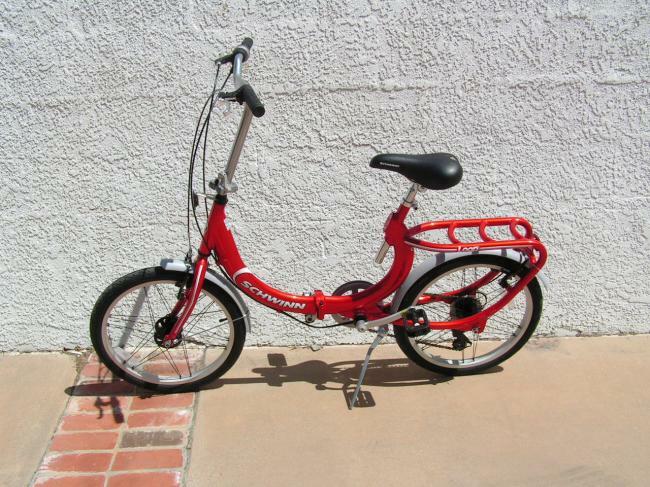 The time went by, and finally on 3/23/09, I ordered another folding bike from another vendor. It will be delivered to me between 4/1 and 4/7/2009. From my home to work, it's 7 minutes by car, so it will be about 15 minutes by bike. I plan to commute by bike at least 3 times a week. The top contestant, LN, has been walking in the company parking lot for 20 minutes every day during lunch time. She also walks at a 400 meter running track in a park near her house for more than 40 minutes every day. She has cut back on her meals to less than half, too. I should try HARDER~. I will try my best for the rest of 13 weeks. 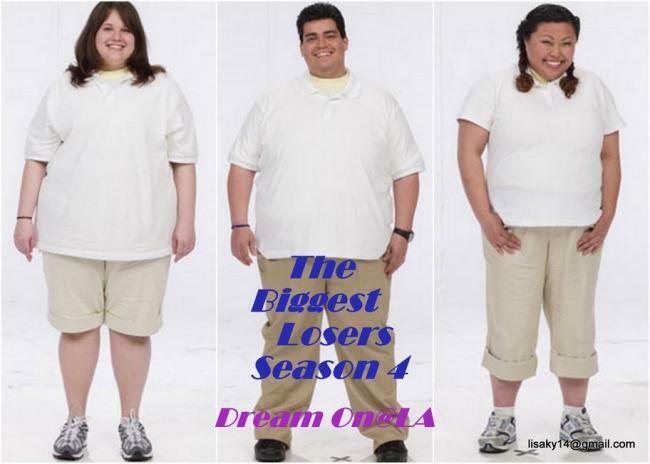 NBC TV Show, "The Biggest Loser". Final photos from the Season 4. 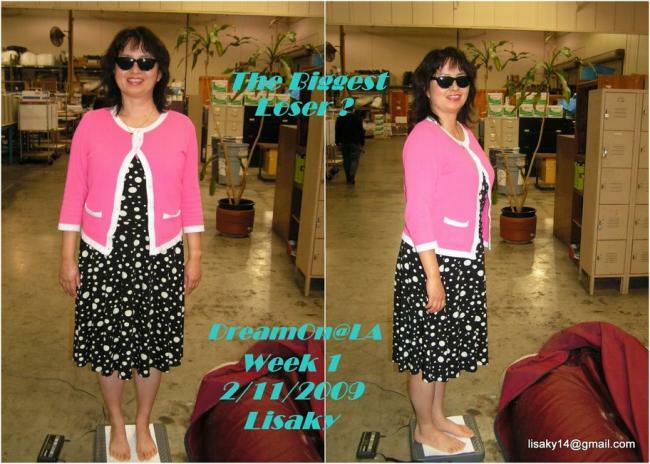 12 Volunteers at my work started "20 Week The Biggest Loser Weight Loss Challenge." It started from 2/4/09 and will end on 6/24/09. We weigh in every Wednesday at 2 PM at work. The winner would be the one who has the highest percent weight loss (weight lost/original weight x 100). The participation fee is $20 each person and the winner gets all the money ($240). Photo on 2/11/09. I would like to loose 27 ponds by the final, 6/24/09...!? 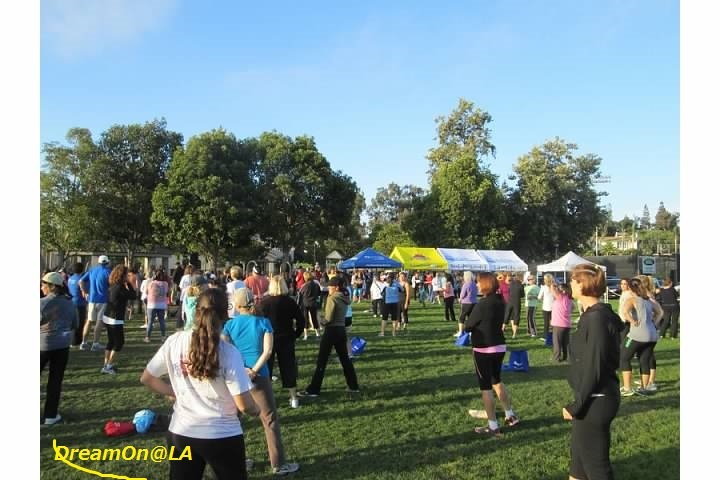 This "Biggest Loser Challenge" is a copy cat of NBC's "The Biggest Loser" TV show. The real one is for 12 weeks. The contestants are placed in a boot camp, and there are extreme workouts by personal trainers and extreme diets. The winner gets $250,000. Our version does not have the personal trainers. There are no boot camps or extreme workouts. It's all up to the participants. 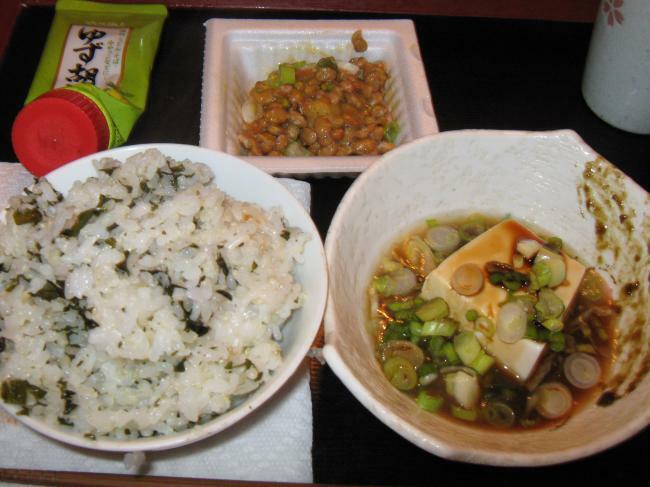 My lunch on 2/10/09. 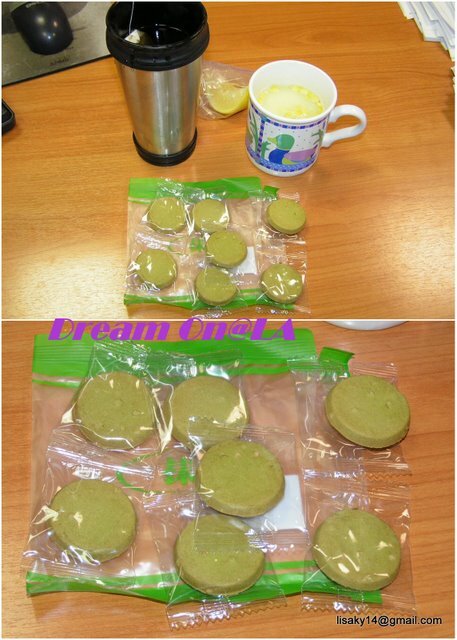 Soy Milk Okara Cookies (60 calories) and a Corn Soup (50 calories). There are 4 male and 8 female participants. The person with the most lost percentage was a male participant. He lost 4 ponds (about 2 KG) in a week. I lost only 0.5 ponds (200 grams). Well, I ate a lot over the weekend. I will take it easy and try little harder in 19 weeks.